Happy New Year! Hope you enjoyed your holiday season. It’s been non-stop rain here in Atlanta but the sun just came out today. YAY! 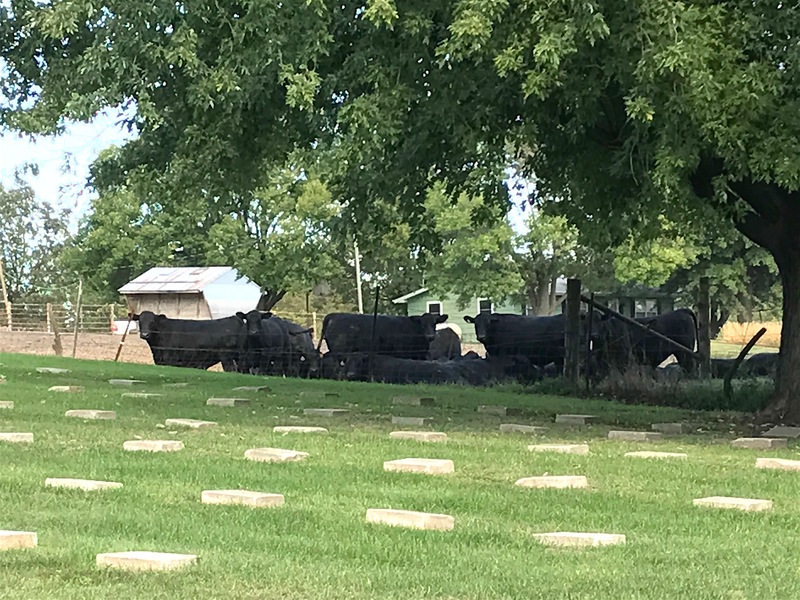 Last time, I shared the story of a tragic train accident that took the lives of three people buried at Malvern Cemetery in Iowa. 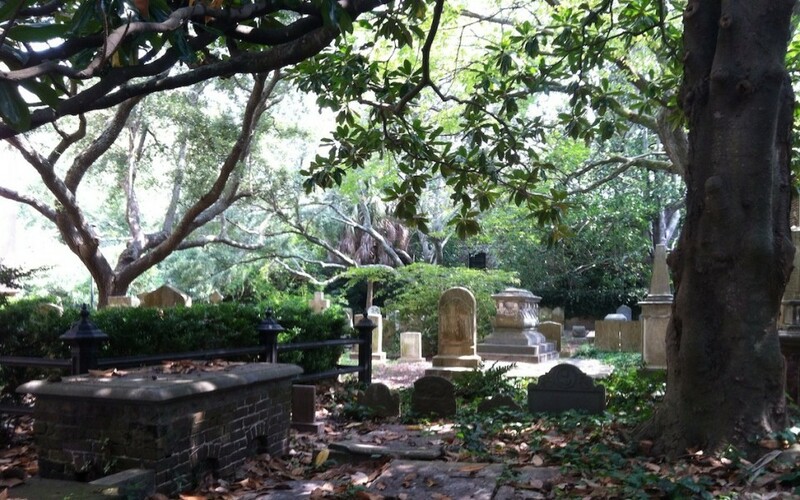 Today, I’m going to share some more stories about those buried there. So often we see a gravestone and have little idea of who the person was or what was the cause of their demise. 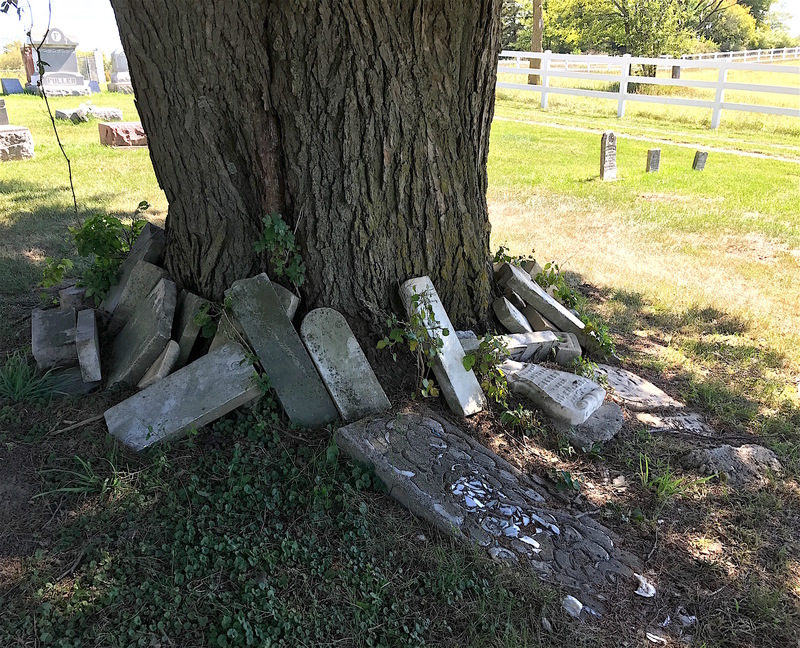 However, thanks to the efforts of Find a Grave volunteers and better access to historic books and documents, we have more opportunities to fill in the blanks now. One example is Andrew Scott. 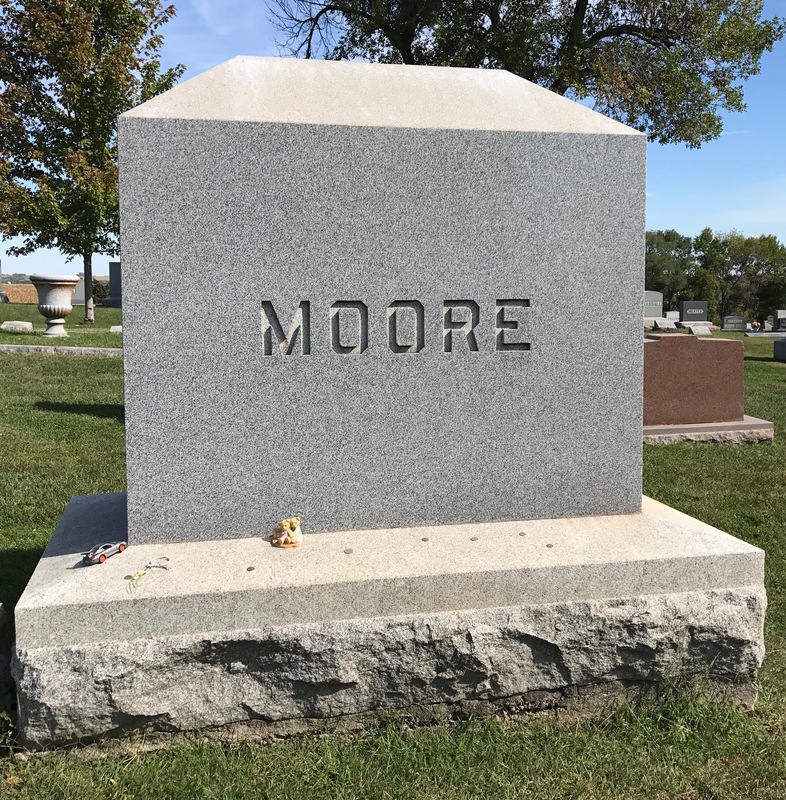 I photographed his marker partly because it features a handsome example of the Modern Woodmen of America seal. 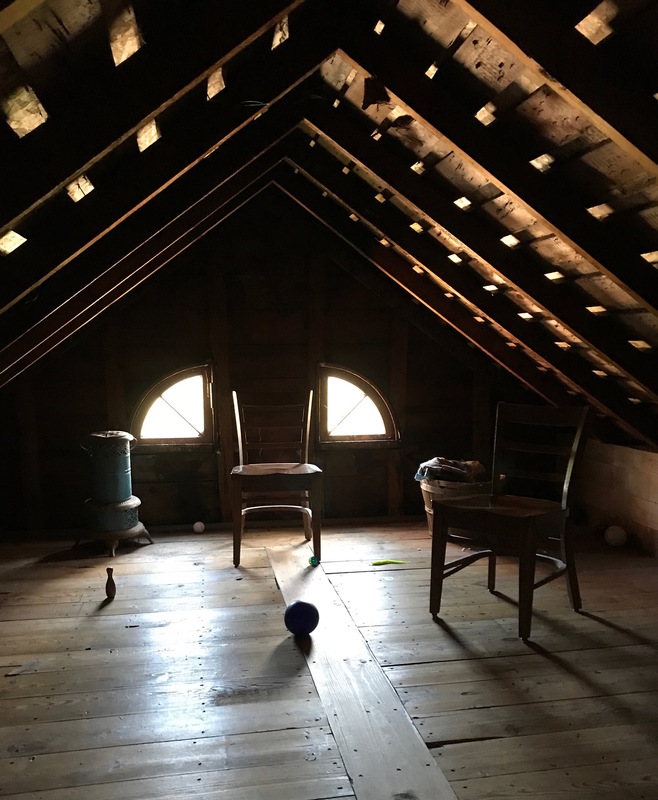 I’ve written about Woodmen/Woodman in its various forms in other posts. 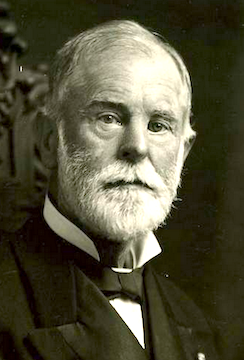 Joseph Cullen Root founded MWA in 1883 but eventually was ousted when fellow leaders disagreed with him. He started Woodmen of the World soon after. Andrew Scott was only 21 when he died from “disease of the throat”. He was about 21 years of age and loved by all who knew him for his upright character. He went to New Mexico for his health and it was thought he was entirely cured. The immediate cause of death was from disease of the throat. Those who were with him at the time of his taking off pronounced him as having been resigned beyond the lot of most young people, coming to his end with the peace which passes all understanding. I’m not sure what “disease of the throat” killed poor Andrew but I’m sure his parents were devastated. They are buried close by. When I looked up his father, Samuel, I read another rather tragic story. By 1910, he and Andrew’s mother, Teresa, were living in Lincoln, Neb. According to the account I read, Samuel was riding on a streetcar in Lincoln when he experienced a sudden fit of paralysis (possibly a stroke). I can’t imagine how frightening that must have been. A few days later, he had what was probably a second stroke and died at home. 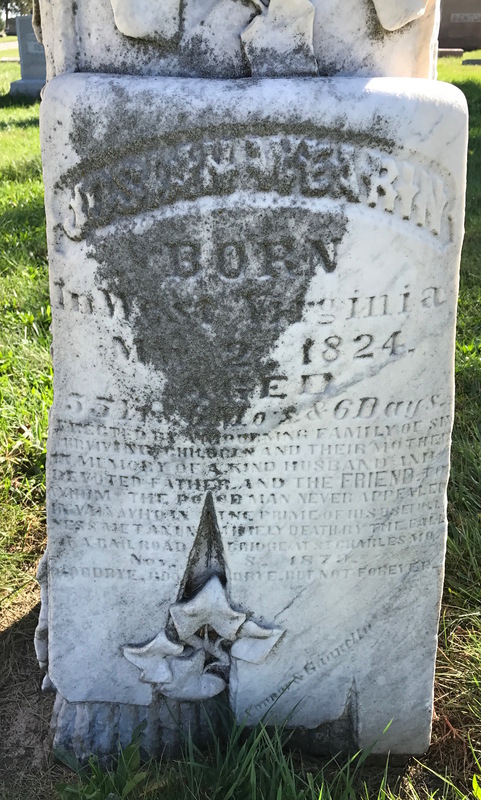 A Civil War veteran, Samuel was 68 years old when he died. 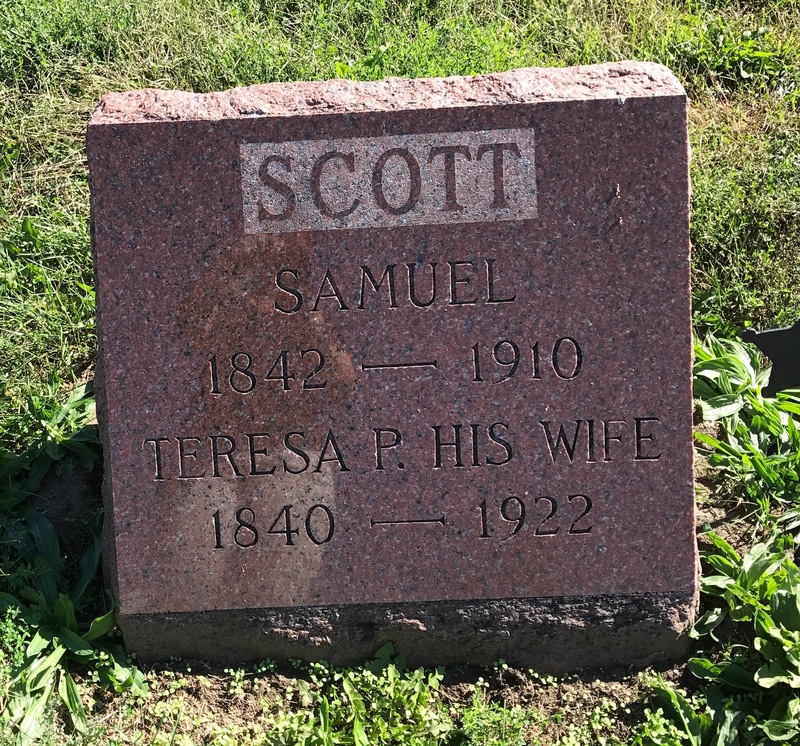 Samuel Scott was stricken with paralysis on a street car in Lincoln, Neb. a few days before he died. When I looked at Samuel’s records on Ancestry, a descendant had noted that Samuel had been an invalid since 1875. The 1880 Census lists him as a farmer and the 1900 Census lists him as a dry goods merchant. There is a record of him receiving a Civil War invalid pension starting in 1879. Teresa received a widow’s pension after his death. The family wish to extend to the motorman and conductor and also to their neighbor, Mr. L. Bauer, their sincere thanks for the kindness in assisting Mr. Scott after he was stricken while a passenger of the street car. 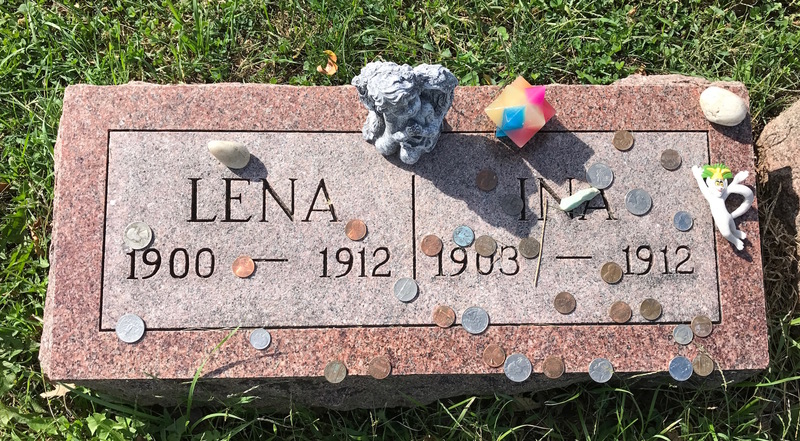 Teresa died 12 years later in 1922. 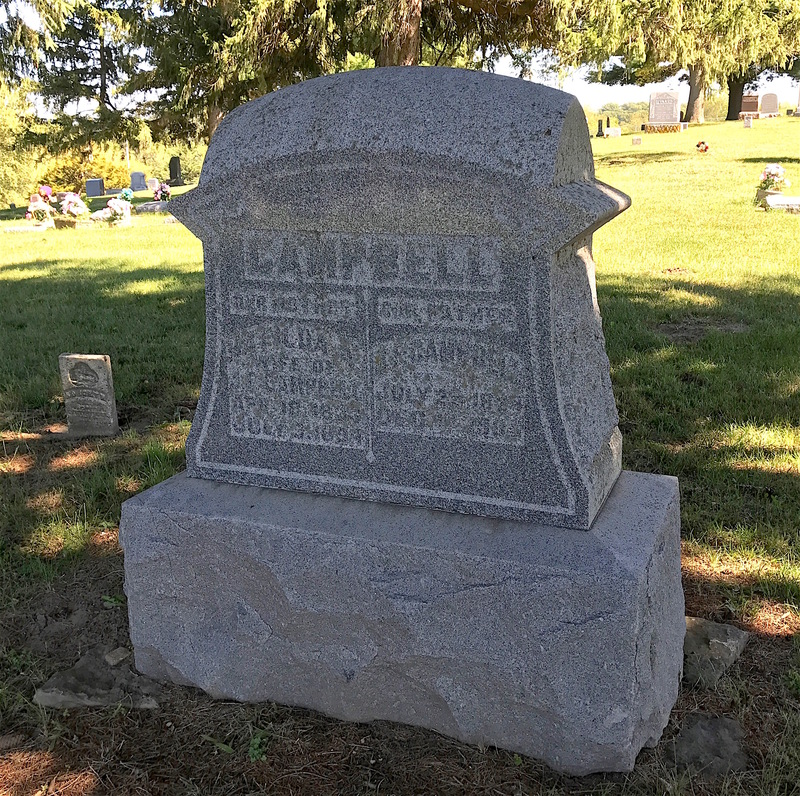 Her parents, Andrew and Ellen Purcell (spelled Pursell on the monument), are also buried at Malvern Cemetery. 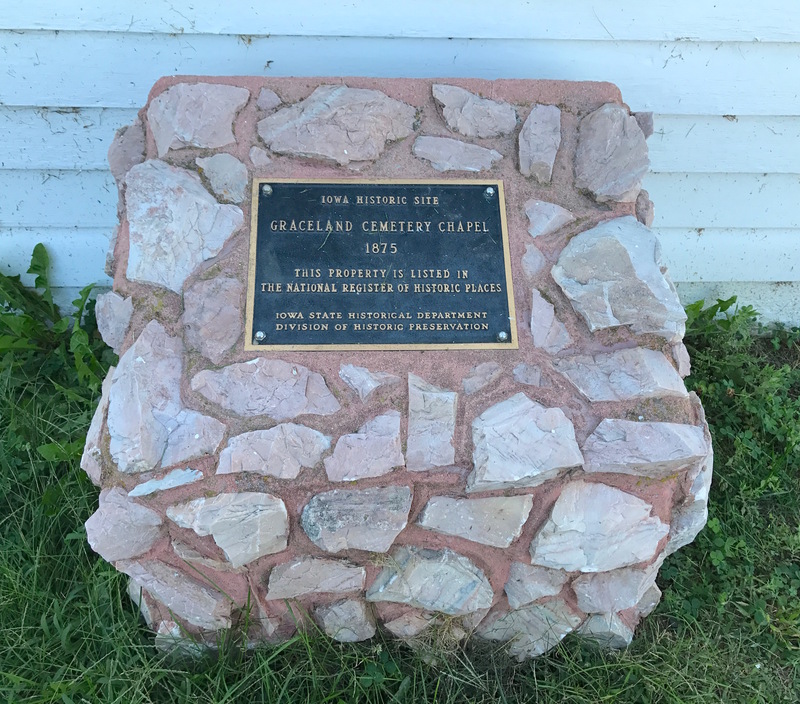 Their monument lists nine of the children they had together. The first five were all born in other states before the Purcells settled in Iowa. Most of the ones listed died in infancy. The monument for Teresa Purcell Scott’s parents lists many of her siblings on the side. Ellen died in 1892 at the age of 71. 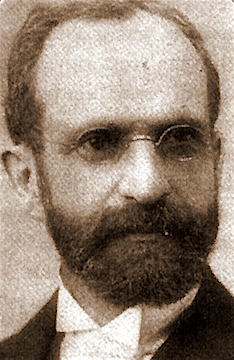 Andrew remarried to Mary Dayuff and died in 1908 at the age of 89. Monuments like the Pursell one are so valuable to descendants tracing their roots. It’s highly possible some of these infant children would never have been known about had it not been for their inclusion on this marker. 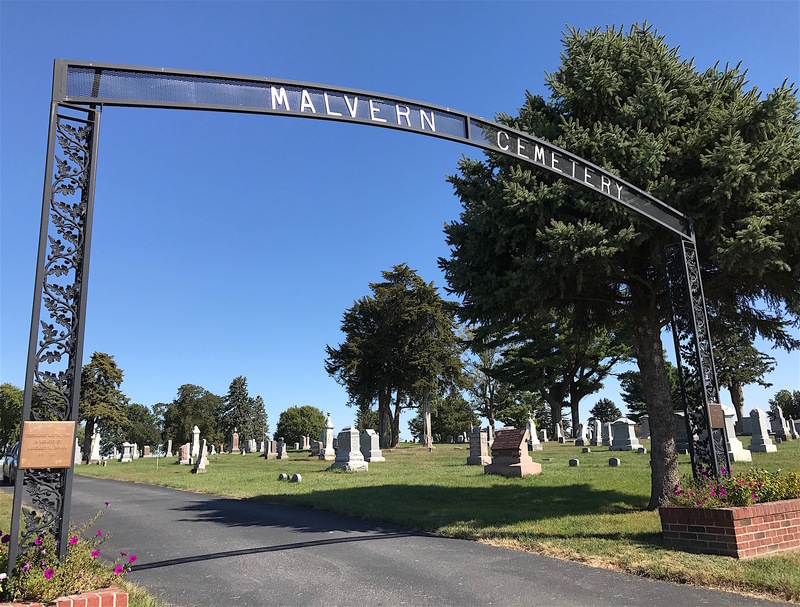 There are several Raines (also spelled Rains by some) buried at Malvern Cemetery. 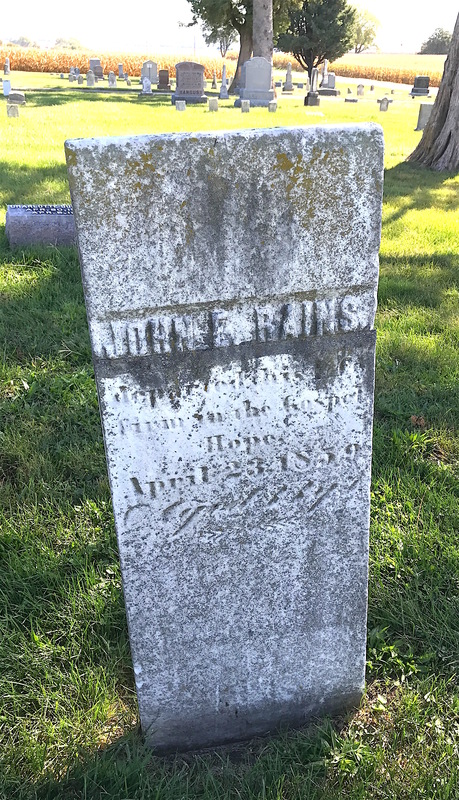 I noticed that the grave of John Raines was off by itself and I wondered why. I was not prepared for the tragic story that unfolded. 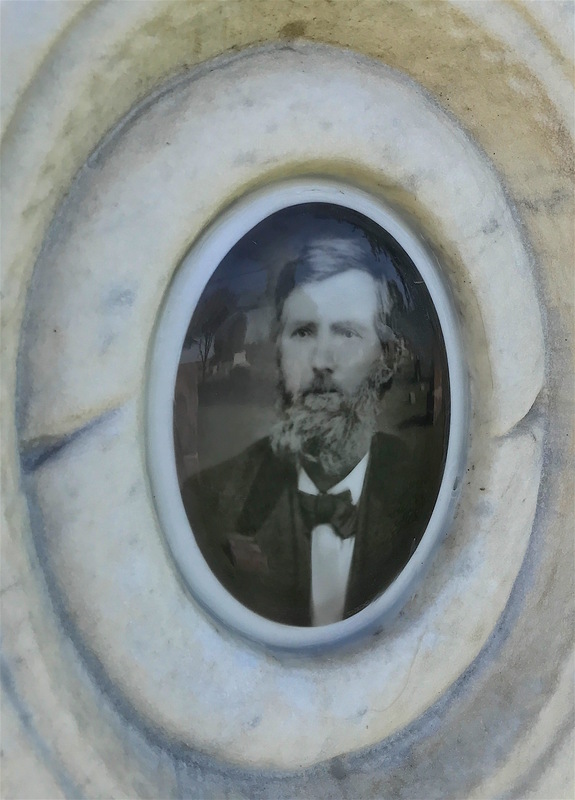 John Rains was the son of Henry Raines, the man who originally owned what became Malvern Cemetery, burying his youngest daughter Elizabeth their in 1857. John married Elizabeth Williams in Pettis County, Mo. in 1847. By 1853, they had five children, James, Mary, Taylor, Elliot and Elizabeth. On July 3 of that year, a Sunday, John went to church and left Elizabeth at home with their children, including the eldest, James. According to accounts I read, a slave named Sam owned by the neighboring Henry France family came to the Raines farm and tried to force himself on Elizabeth. She ran but he allegedly beat her to death when she attempted to get an axe from the nearby woodpile. He then allegedly beat the children to silence them before fleeing the scene. One or two of the children died, accounts vary. John Rains moved to Malvern in 1853 after the murder of his wife in Missouri. When John got home, he found Elizabeth dead by the woodpile and James looked to be nearly so. But James revived and told his father what he had seen. After Sam was apprehended, he first denied it, blamed his brother, then admitted he had done it but only under the behest of his owner’s son, William France, a known troublemaker. What happened over the next days was horrifically predictable for the times. You can read the details here but Sam was eventually forced out of his jail cell in Georgetown, Mo. by an angry mob. The mob chained him to a tree and set a fire around it that eventually killed him. Nothing was ever done to William France but the family moved to another part of Missouri shortly after. 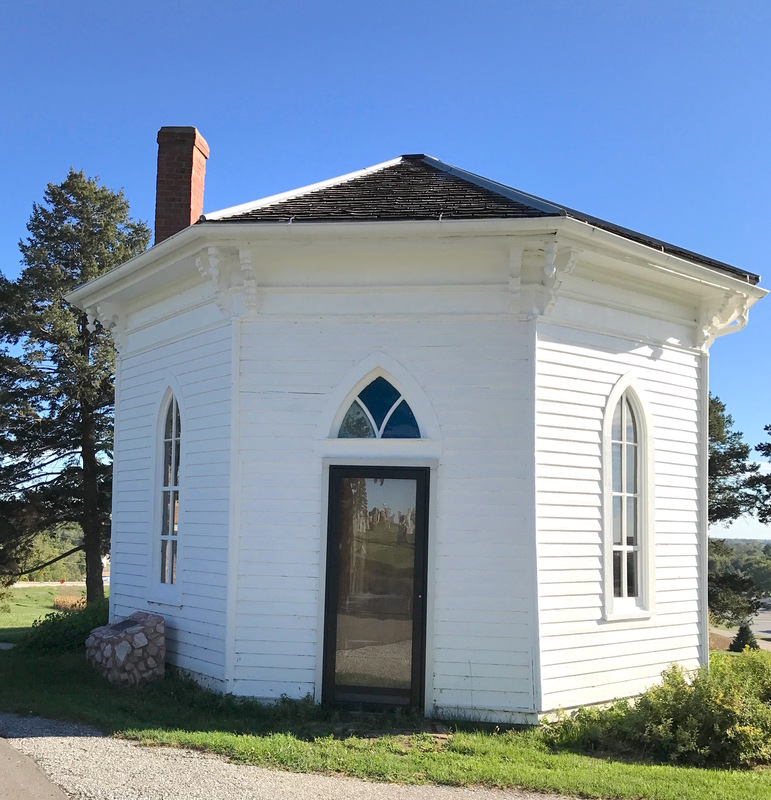 John moved with his surviving children to Mills County and was appointed postmaster of Fayette six months before he remarried to Martha Goode in December 1857. They had one son, William, before John died from tuberculosis in 1859 at age 33. Martha and William eventually moved to Enid, Okla. She died in 1914 and is buried at Malvern Cemetery with no marker. 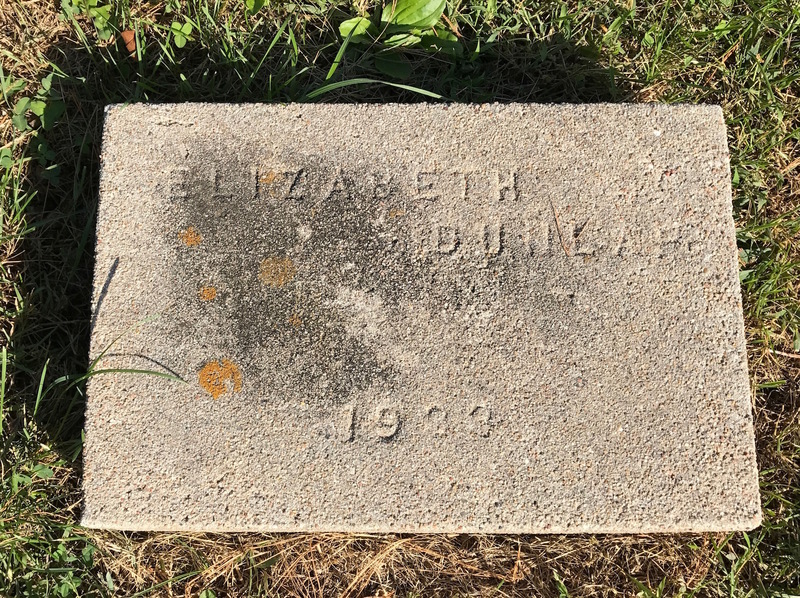 Elizabeth is buried in Old Union Cemetery in Georgetown, Mo. in an unmarked (or unphotographed) grave. I learned that both James and Taylor lived to adulthood and moved to other states. William, John Raine’s child with Martha, also lived to adulthood. 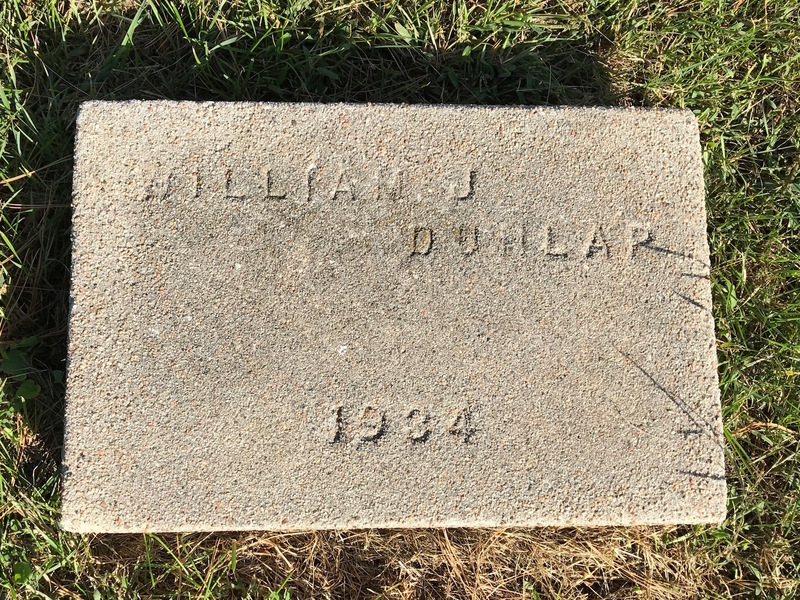 He is buried in Memorial Park Cemetery in Enid, Okla. Finally, I found a marker for David H. Robinson and his wife, Cynthia. A native of Indiana born in 1844, David and his family had moved to Iowa by 1860. He married Cynthia Darnell in May 1863. They had one son in 1864. 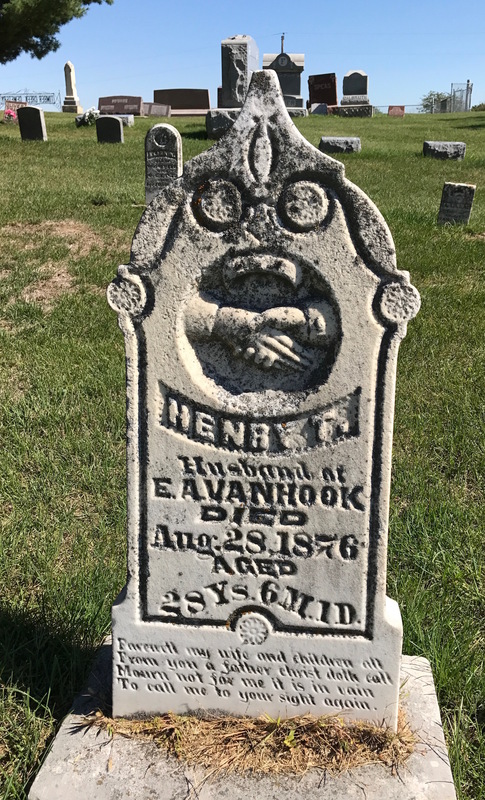 David and his younger brother, Howard, enlisted in the 36th Iowa Infantry in February 1864, little knowing what fate awaited them. David Robinson survived 13 months in a Confederate prisoner of war camp in Tyler, Texas. David and Howard were in Company D of the 36th, which took part in the disastrous Battle of Marks Mill in Arkansas in April 1864. They were among many in the 36th Iowa Infantry taken prisoner and sent to Camp Ford in Tyler, Texas, the largest Confederate-run prison west of the Mississippi River. During the course of the war, the total number of prisoners who passed through Camp Ford was slightly more than 5,500. Although a good spring provided clean water and the Confederate guards slaughtered cattle to supply the prisoners fresh beef, prisoners had no shelter from the sun or rain except improvised huts or blankets. As the numbers of prisoners rose, the sanitary conditions declined precipitously, leading to many deaths from exposure, chronic diarrhea, and disease. Originally a Confederate training facility, Camp Ford later became a prison camp for captured Union soldiers. In spite of those conditions, about 327 prisoners died in captivity, giving the camp a mortality rate of 5.9 percent, one of the lowest of any Civil War prison. 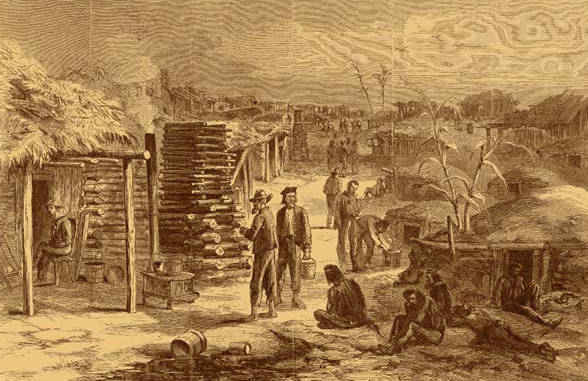 Compared to Georgia’s Andersonville, prisoners at Camp Ford at least had a chance at surviving until a prisoner exchange freed them. The brothers survived their year-long confinement. 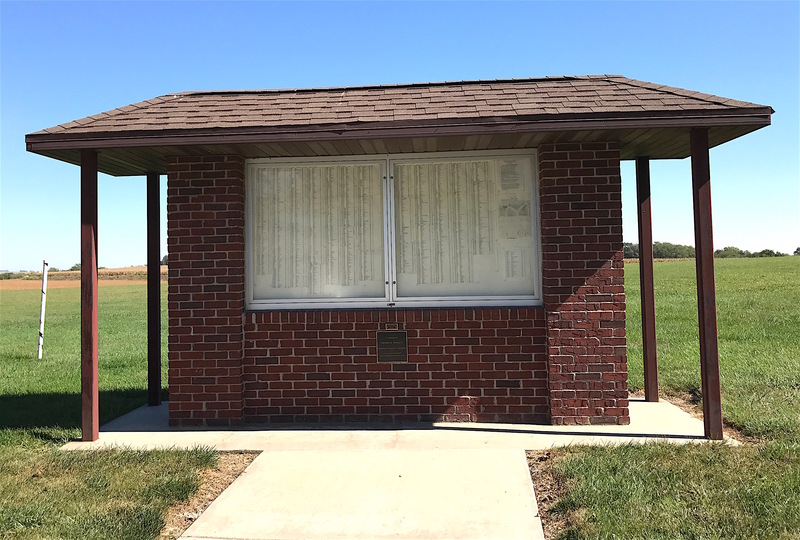 Accounts indicate the 36th Infantry prisoners were released in May 1865 through a prisoner exchange, returning to their regiment to fight at Jenkin’s Ferry before mustering out in August 1865. The brothers returned to Iowa. Both brothers continued farming and were also ordained to preach. Both Robinson brothers were ordained to preach. 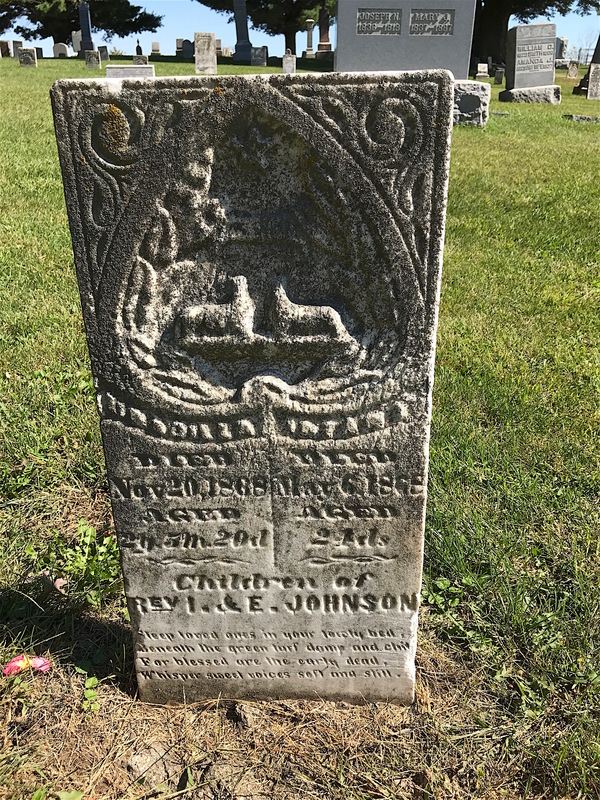 David and Cynthia had several more children before he died in 1895. Cynthia died in 1919. 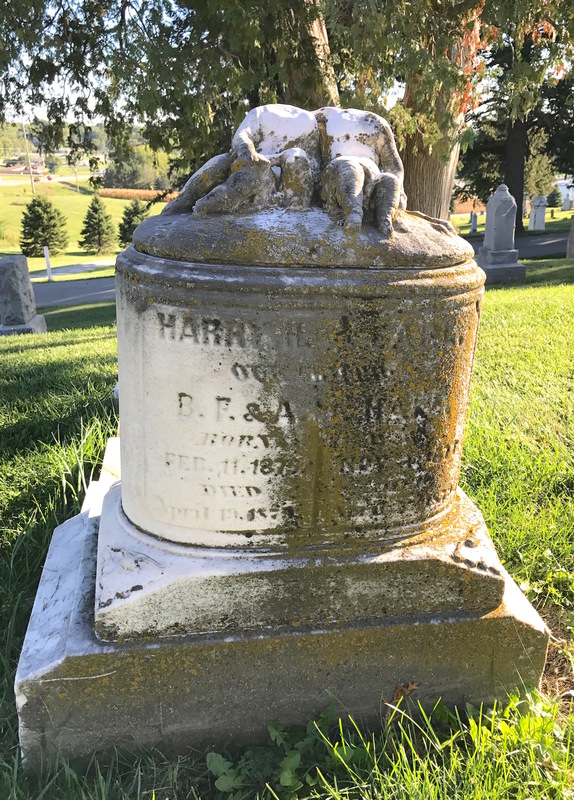 Brother Harold, who married in 1895 in Nebraska, moved to Spokane, Wash. before he died in Los Angeles, Calif. in 1917. He is buried in Oak Park Cemetery in Claremont, Calif. 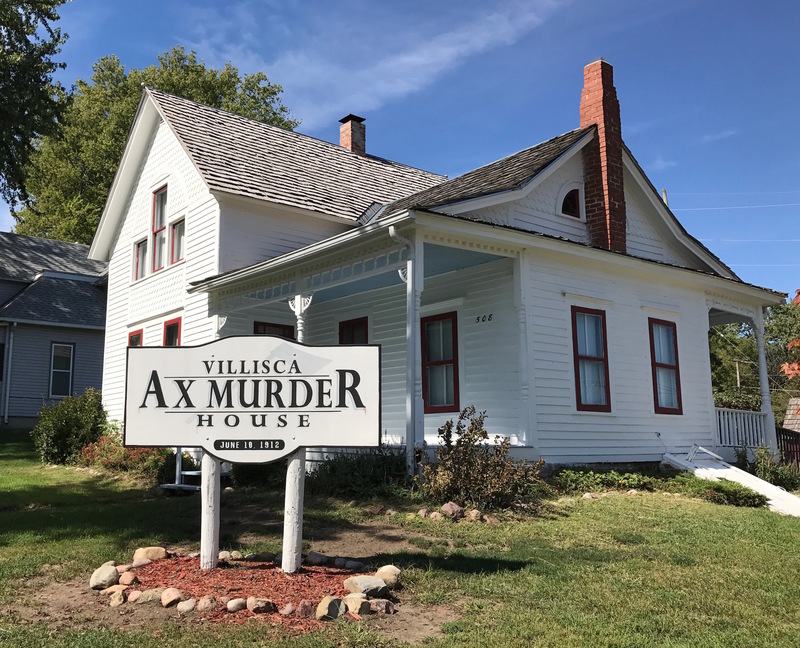 It was time to head on for Villisca and its infamous Murder House. 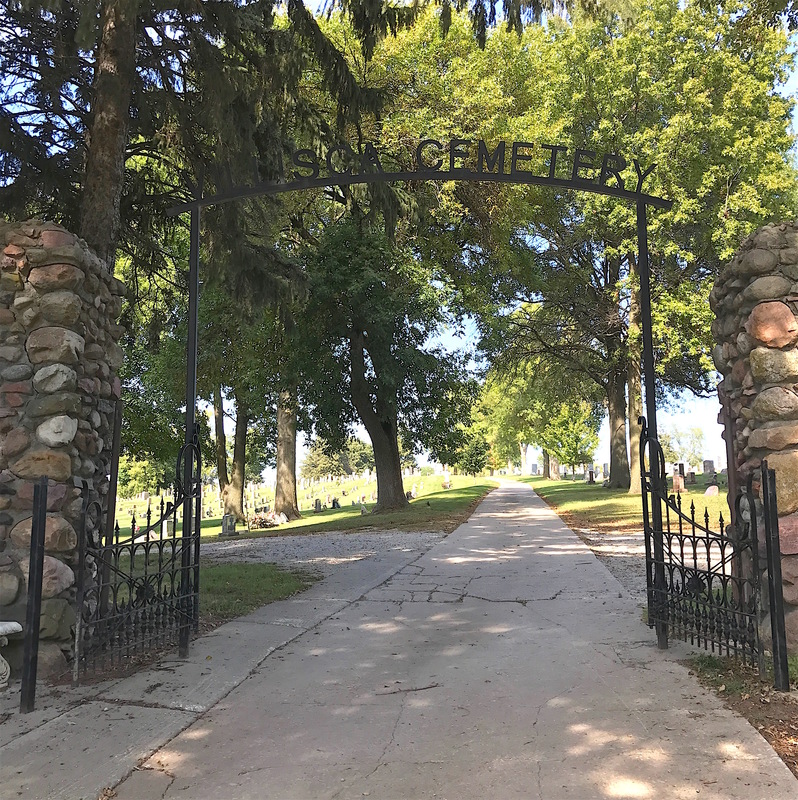 You’ll want to come back for that and my visit to the Villisca Cemetery. 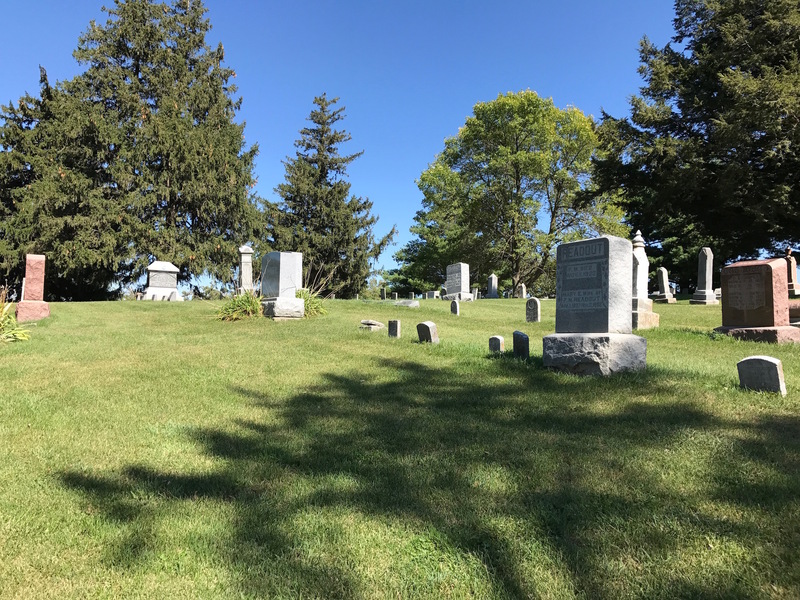 We’re back at Riverside Cemetery in Marshalltown, Iowa. One of the town’s beloved sons was Sergeant Charles Willard Peckham, who created magic in the skies when he flew. The following details and photos came from research done by Riverside’s staff. They told me where his stone was located but because we were in a bit of a rush that day, I didn’t find it. But his story is still worth sharing. Born on August 4, 1897, Peckham graduated from Marshalltown High School in 1916. 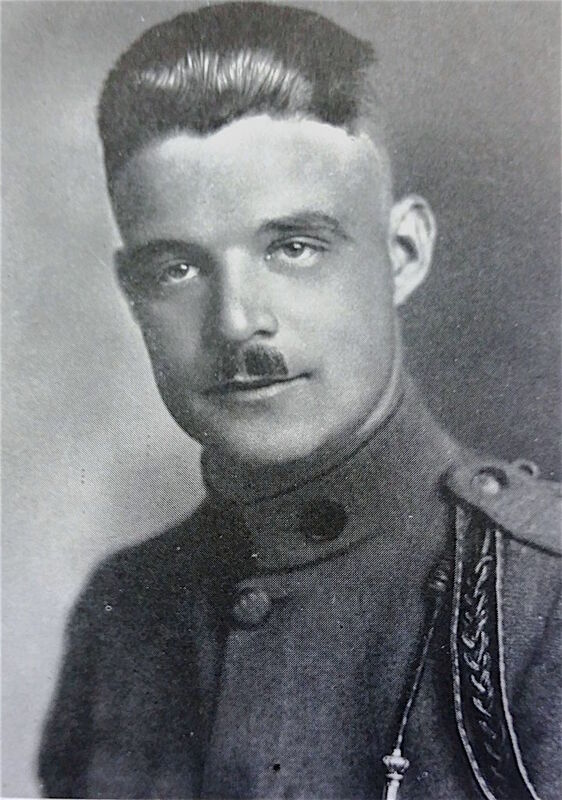 After a year at the state university, he enlisted in the American Expeditionary Forces in May 1917 during World War I and went to France later that summer. He joined the 103rd Aero Squadron of the Lafayette Escadrille, part of the WW I French Air Service, which consisted of mostly of volunteer American pilots flying fighter planes. During this time, Peckham was cited for bravery three times and promoted to first class sergeant. At one point, it was feared he was captured but the rumors were fortunately untrue. He sent home to his father a fabric Iron Cross he’d cut from a downed German airplane. 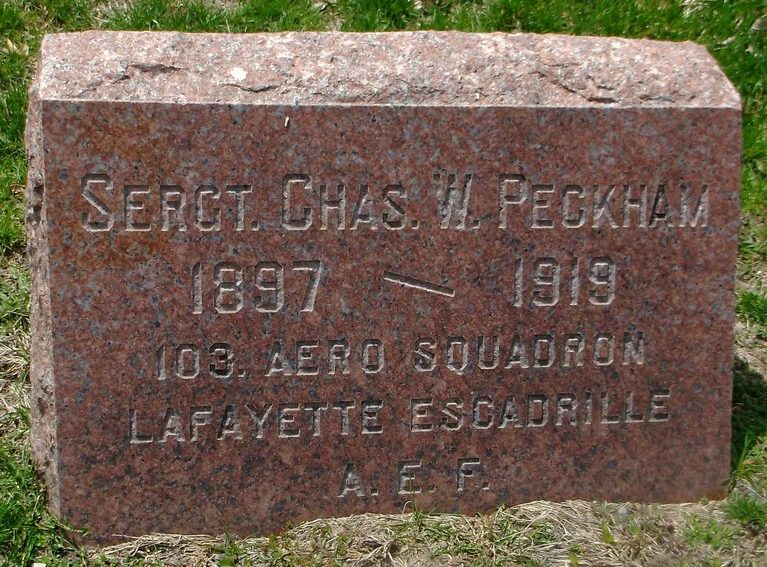 Peckham was the lone pilot in the Lafayette Escadrille to be chosen by his commanding officer for appointment to West Point. But when the war ended, Peckham was done with military life. He came back to America and joined a “flying circus,” touring the country promoting victory loans (bonds issued to help pay for the war). 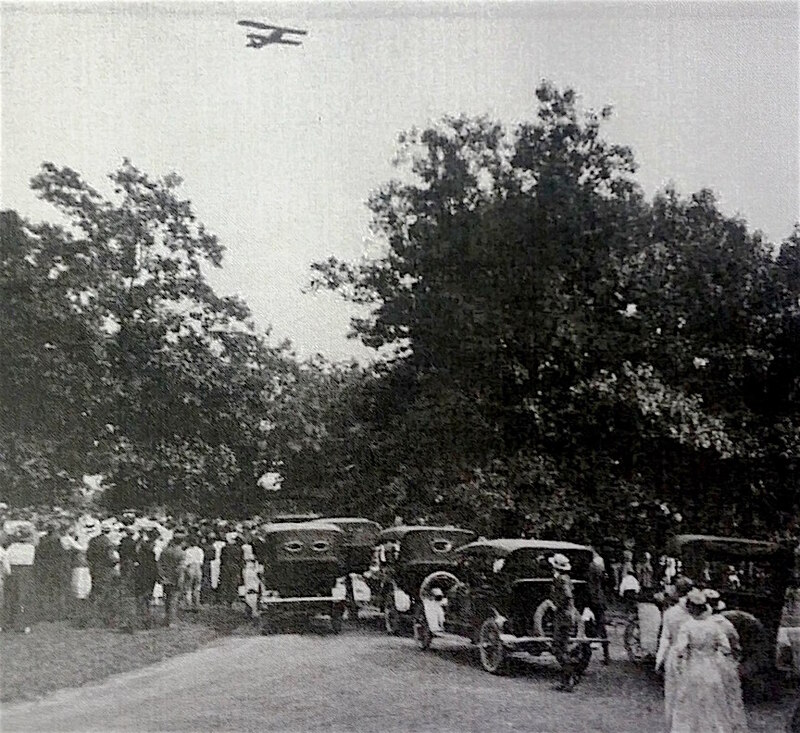 Peckham joined the Iowa Aero Company of Des Moines, which performed at an event on Friday, August 22, 1919 in Des Moines, with 100 or so people present. He and another pilot gave rides to spectators that day. Later, despite earlier engine problems, the pilot managed to get the plane started and up in the air, and Peckham stepped out onto the wing. The plane began to tailspin and Peckham dropped 1,000 feet to the earth, enduring fractures below the knees of both legs and a fracture of the base of his skull. 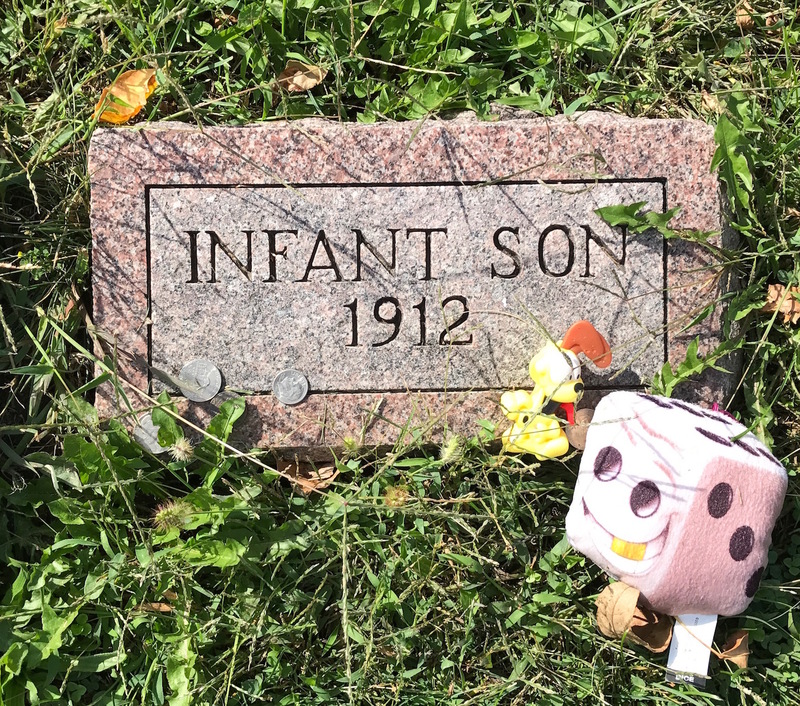 He was moved to the Methodist Hospital, where he died on Sunday, August 26, 1919, with his parents beside him. A local newspaper article reported that two members of the Iowa Aero Company who were also servicemen would fly over the grave and “drop flowers as was done in France when a member of the air service was laid to rest.” The photo above the grave marker photo is believed to be of Peckham’s funeral at Riverside Cemetery, part of a cache of photos from the The Gold Star Museum at Camp Dodge in Des Moines. I also want to mention James Christopher “Sunny Jim” Dunn and his wife, Edith Dunn. Both were trailblazers of a sort, although for different reasons. 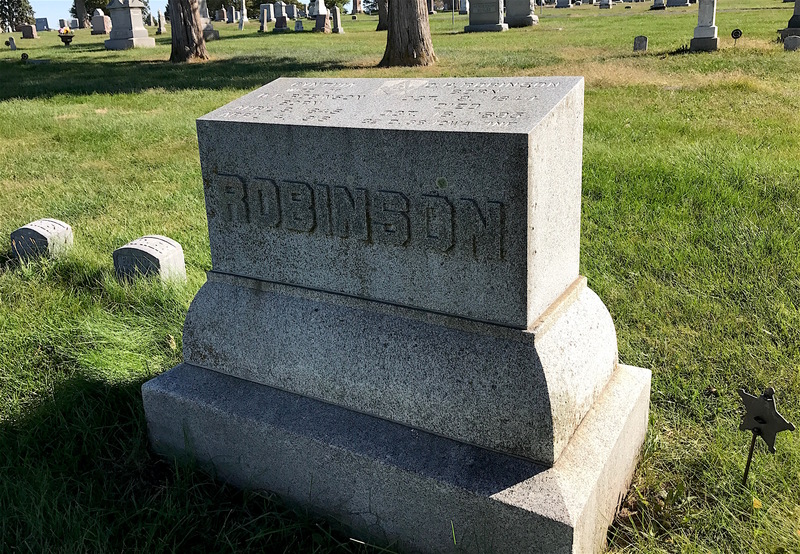 Born in Marshalltown in 1864, Dunn met Henry Anson (whose son “Cap” was a Major League Baseball player in its infancy) when he went to work for the A. E. Shorthill Company, where the elder Anson was also employed. He convinced Anson to lend him money to start his own business, first in the coal industry, then in railroad contracting. It was Dunn’s partnership in a railroad construction firm that sent his fortunes rising and he eventually became a millionaire. He and his wife, Edith Forney Dunn, lived in a mansion in Chicago. They had no children. 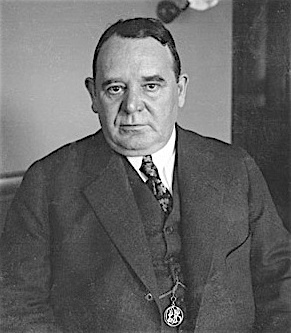 In 1916, Dunn was recruited by American League president Ban Johnson to head up a syndicate to buy the Cleveland Indians baseball team from Charles Somers for $500,000. During his tenure, the team’s ballpark League Park was renamed Dunn Field, although the name reverted back to League Park in 1927. In 1920, the Indians won their first World Series. 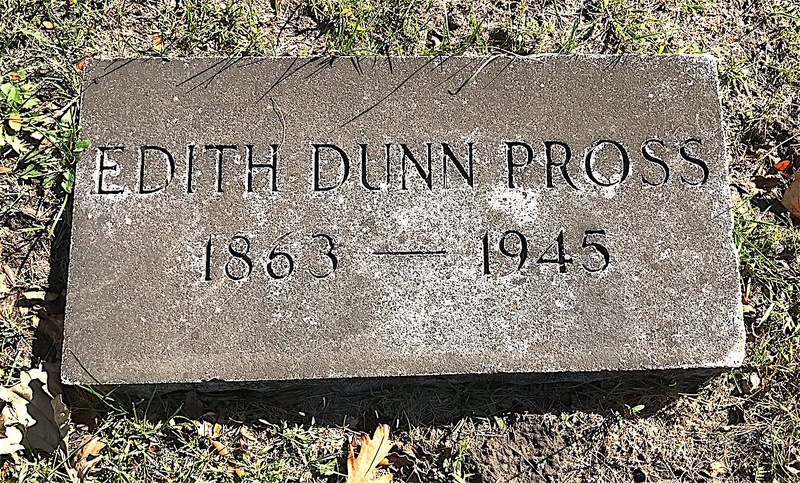 When Dunn died of influenza in 1922 at the age of 57, he left his entire estate worth $390,000 to Edith. That included control of the Cleveland Indians, making her one of the first women to own a MLB team. 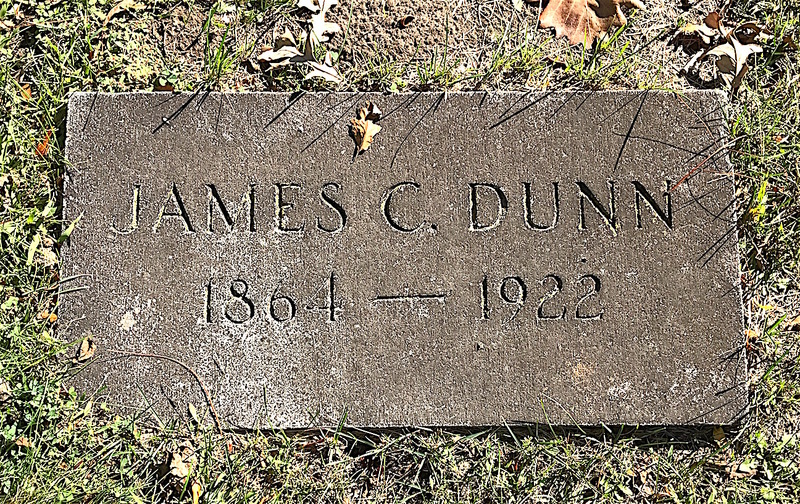 When Jim Dunn died in 1922, he left his entire estate to his wife, Edith. 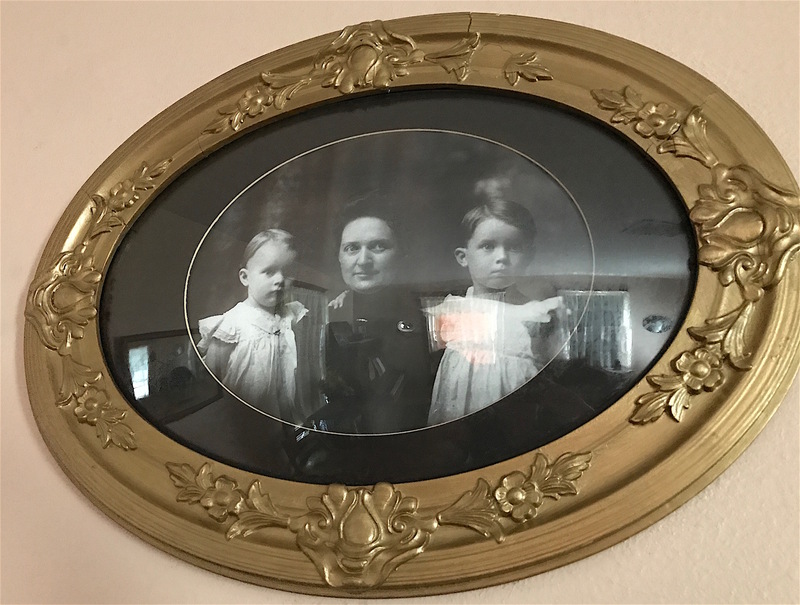 That alone might have made Edith a unique woman of her time but there was something else that caught my attention. Edith remarried a man named George Pross. A native of New York, Pross was 24 years Edith’s junior. He worked as a policeman in New York City before moving to California to become a private detective for the Burns Detective Agency. His name pops up in several issues of “True Detective” magazine in the 1920s. In 1927, ownership of the Indians changed hands when Edith sold the franchise for $1 million to a group headed by Alva Bradley. By 1930, Edith and George were living in a fine home in Pasadena, Calif. before moving to Los Angeles. A year after Edith died in 1946, George remarried. He died in 1967 and is buried in California with his second wife. Edith remarried to George Pross, who was 24 years her senior, and spent her last years in California. Jim and Edith (despite her remarriage) are buried beside each other in Riverside. 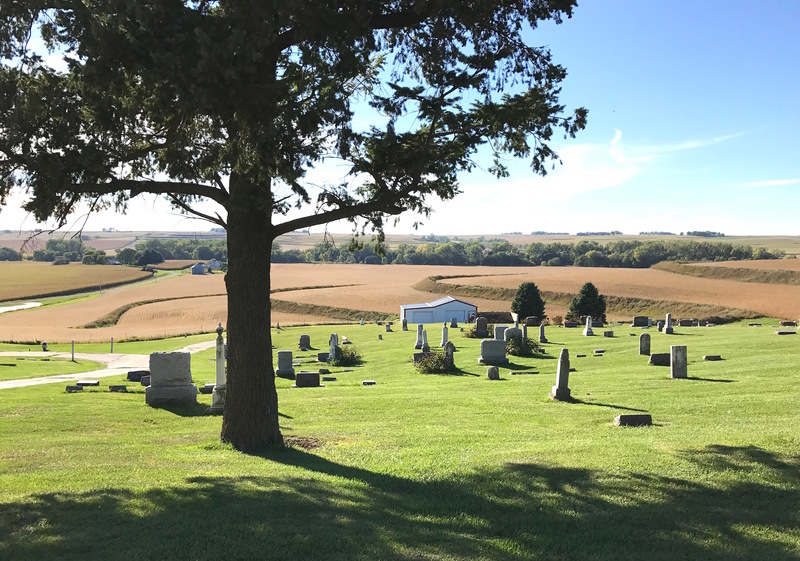 Despite becoming a wealthy man who had moved away, Dunn always considered Marshalltown “my hometown” and wished to be buried there. 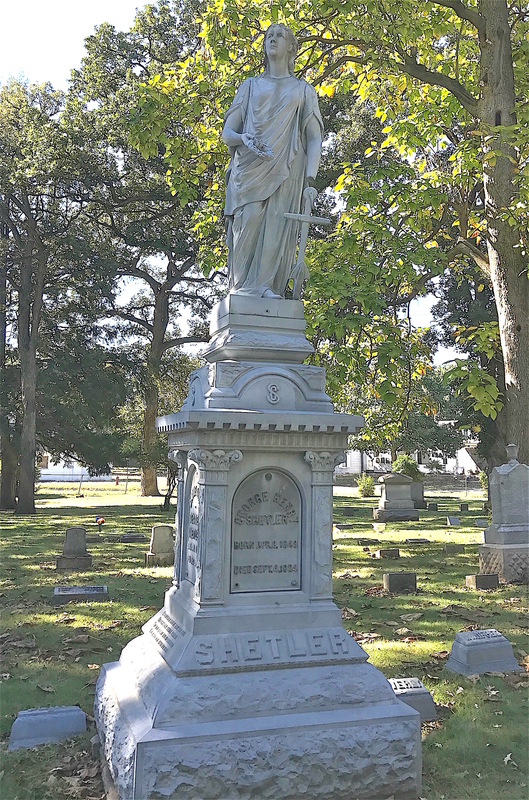 I was delighted to see a large white bronze monument representing the Shetler family. It looks like the woman, holding a laurel wreath (which can mean victory, distinction, eternity or immortality) beside an anchor, is unfortunately missing a hand. 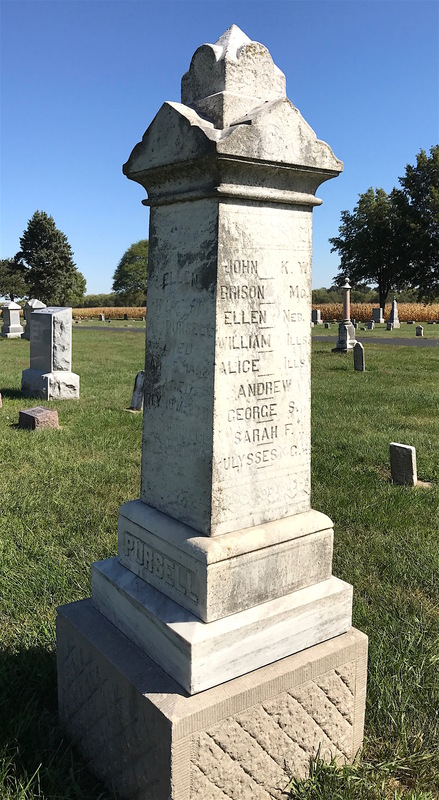 The Shetler family monument has a total of seven people listed on it. A native of Germany, George H. Shetler arrived in America in 1833. He married Ohio native Martha Smith in 1838 in Kentucky. They had several children. In 1857, they moved to Marshalltown where George Sr. farmed. Later, he and his two sons, George Jr. and James, operated a successful harness business. 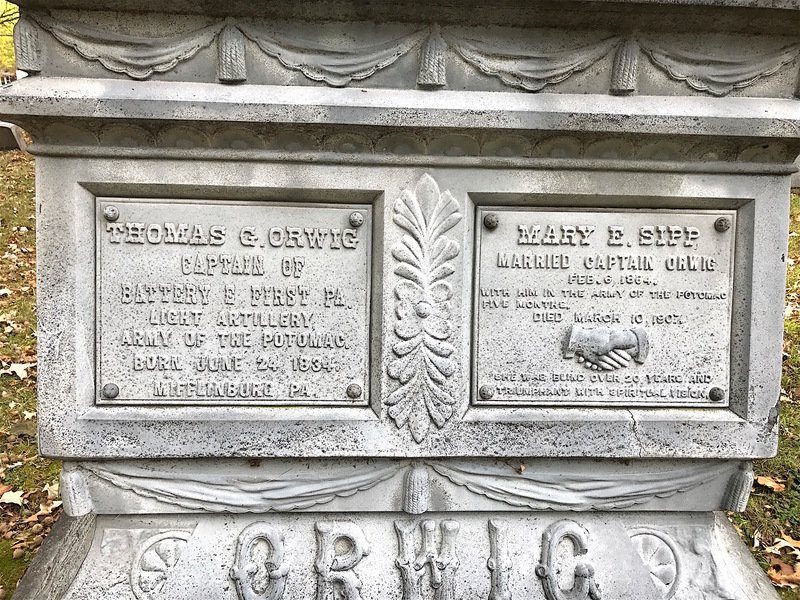 Martha died in 1886 and George Senior died in 1901. Unfortunately, George H. Shetler, Sr. died without a will. This caused much angst concerning how his estate would be divided up, especially some land tracts. 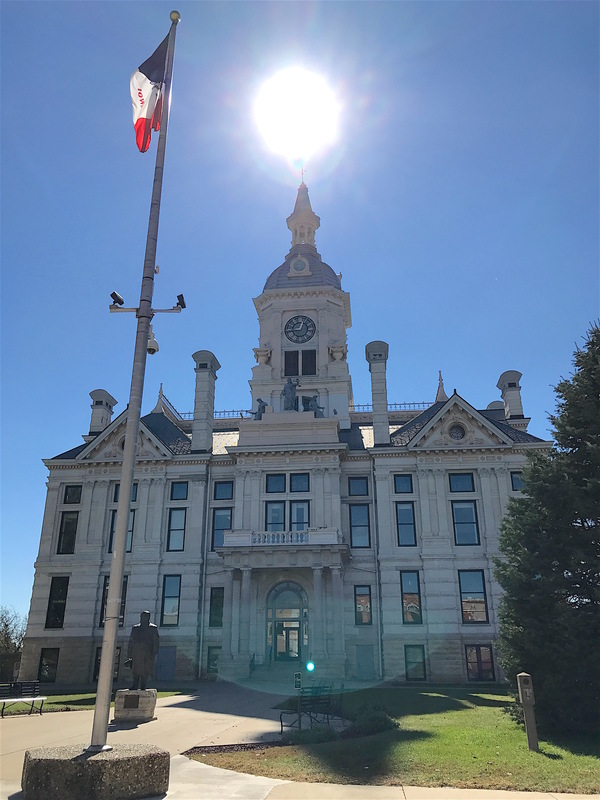 It went as far as the Iowa State Supreme Court before it was all sorted out and by that time (1906), son James had died as well in 1904. The Shetler monument is one of the largest white bronzes I’ve seen. 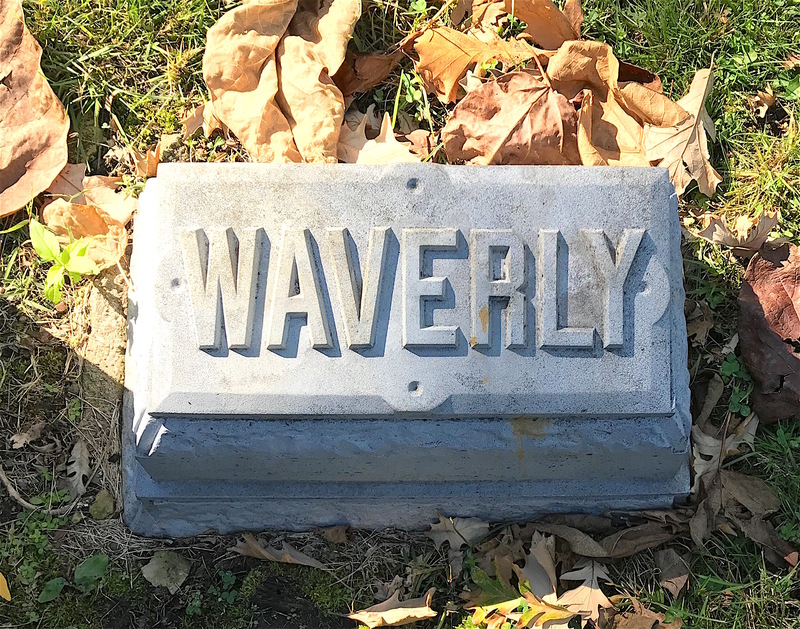 This marker is for Waverly Shetler, the son of George Jr. and grandson of George Sr. . 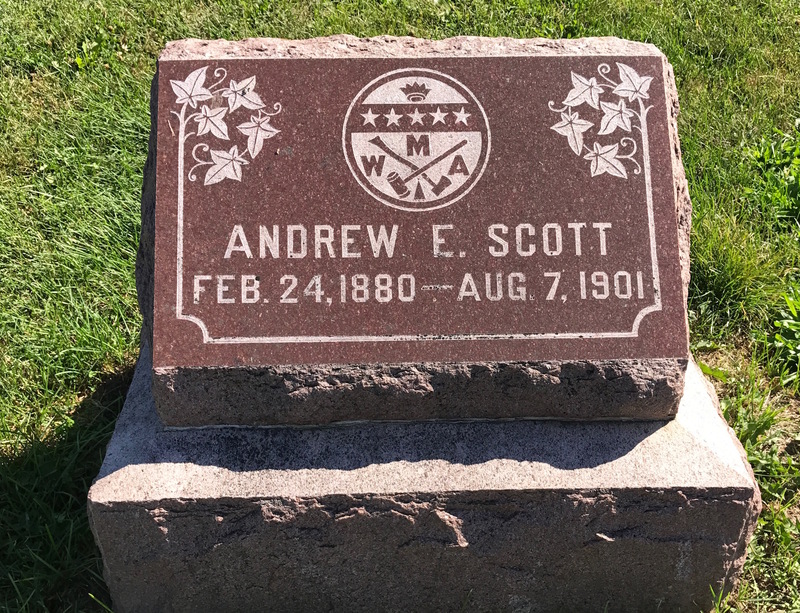 He attended pharmacy school at then-State University of Iowa (now the University of Iowa) in the 1880s and was a practicing pharmacist for a few years. 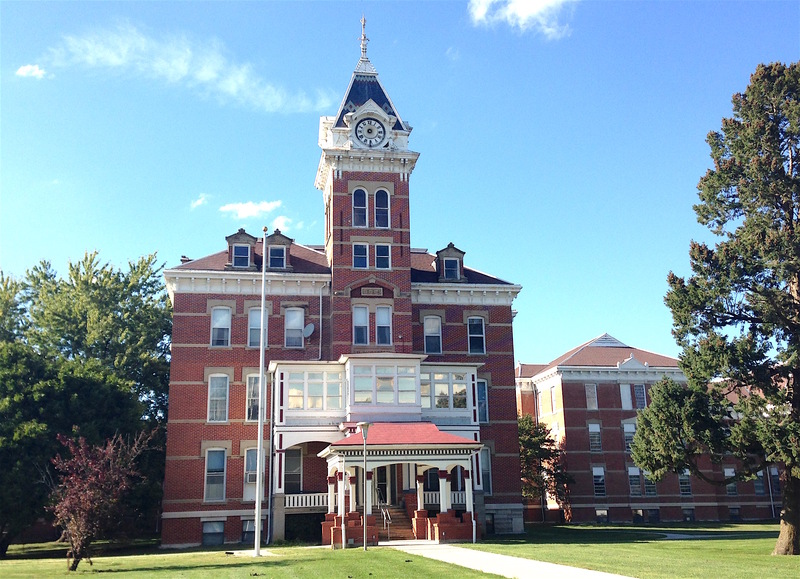 Then in 1895 he graduated from the Colorado School of Mines in Golden, Colo. Why he switched careers midstream is a mystery. 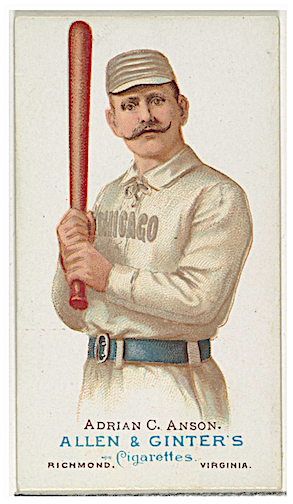 He died in 1901 at the age of 33 in El Paso, Texas. Records indicated that Waverly Shetler had attended pharmacy school at what is now the University of Iowa and the Colorado School of Mines to become an engineer. He died in El Paso, Texas. One last footnote about this cemetery. I didn’t learn until after my visit that Riverside Cemetery is supposed to have a “death chair” on the premises. I did not see it while I was there but if you Google it, you can see pictures of it. I’ve seen stone chairs like it before (some are called “the Devil’s Chair”) and many of them have legends attached to them. The story with this one goes that if you sit on Riverside’s “death chair” at midnight, you will die within the year. So if you’re into that kind of thing, you can keep an eye out for it. 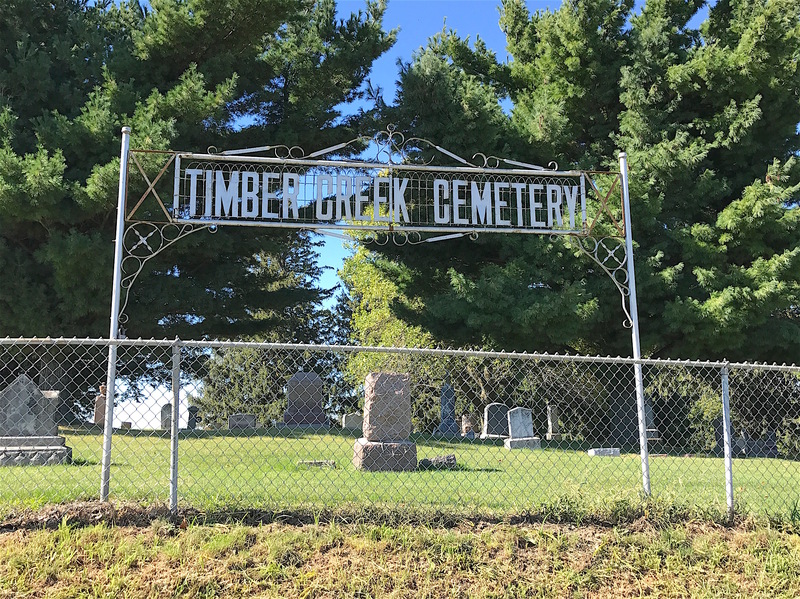 Next time, we’ll visit nearby Timber Creek Cemetery. It’s much smaller than Riverside but still has some stories to share. 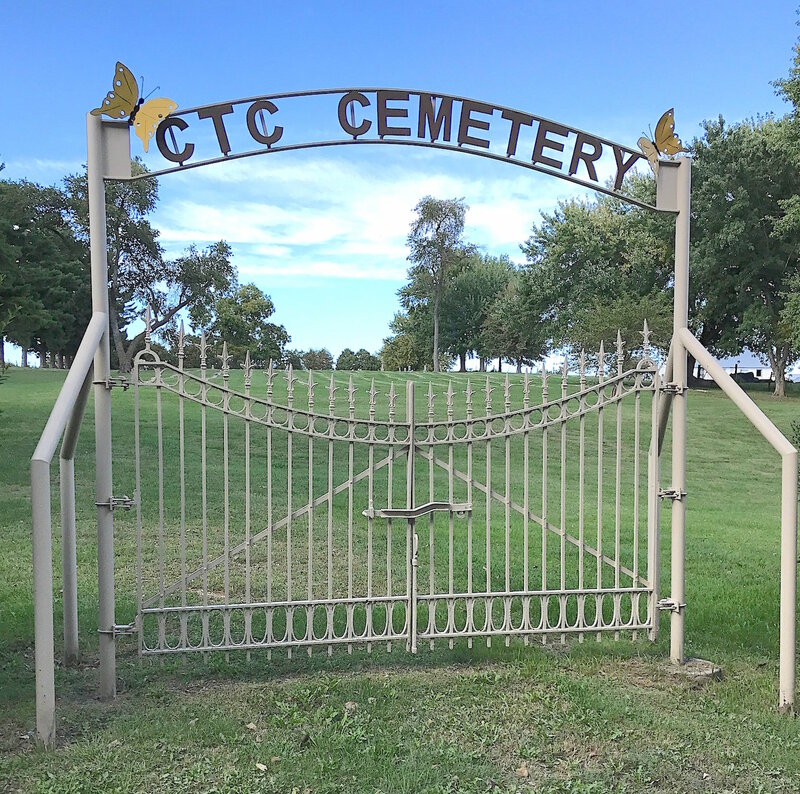 You cannot talk about Iowa cemeteries without mentioning white bronze markers. They’re actually zinc but they were marketed as “white bronze” at the time to make them sound grander. 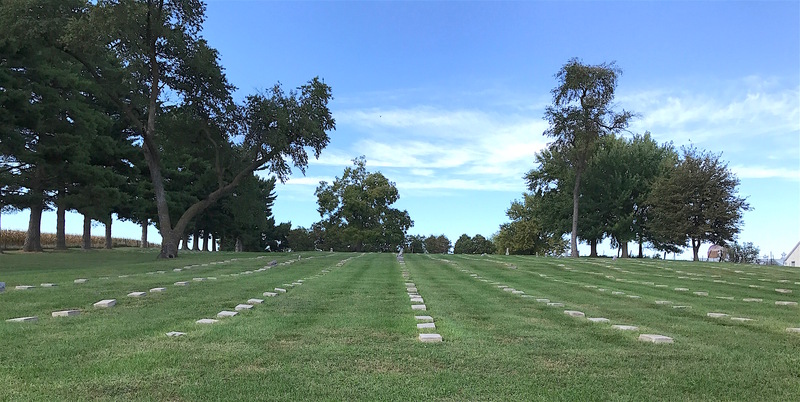 You can get a refresher here in my post about Council Bluff’s Fairview Cemetery (which has several white bronze markers). The parents company, Monumental Bronze Company, was in Bridgeport, Conn. but had subsidiaries in other cities, too. To get a white bronze marker, you usually placed an order with a salesman who had a catalog you could look at. The marker would be shipped to you in pieces that were held together by screws often grounded in a concrete base. As a result, they were hollow inside. Knock on one and you can here the metallic ring. Some were very small like the one below but others were quite grand. 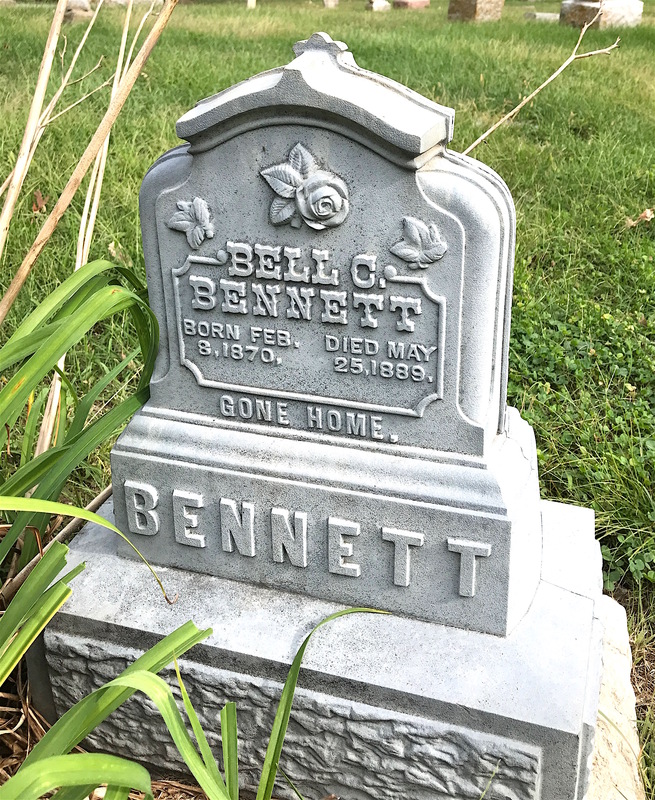 Bell Bennett died at the age of 19. 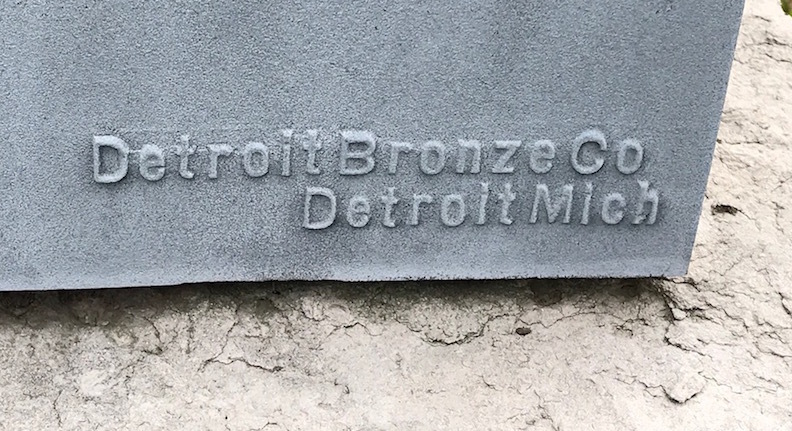 White bronze is important to Iowa because Des Moines was home to the Western White Bronze Co. as one of Monumental Bronze’s subsidiaries, along with Chicago and Detroit. The Des Moines factory opened in 1886 and closed in 1908. In 1914, the government took over the plant to manufacture munitions during World War. I was pleased to see several white bronze monuments/markers at Woodland. 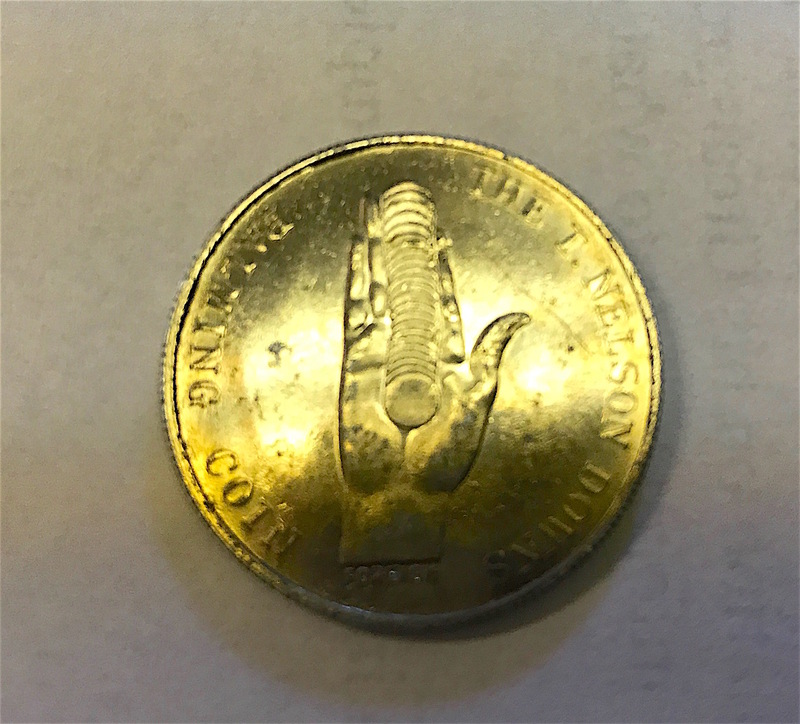 This marker is a nice example of a small white bronze while exhibiting a seal of a fraternal organization I’d never heard of. 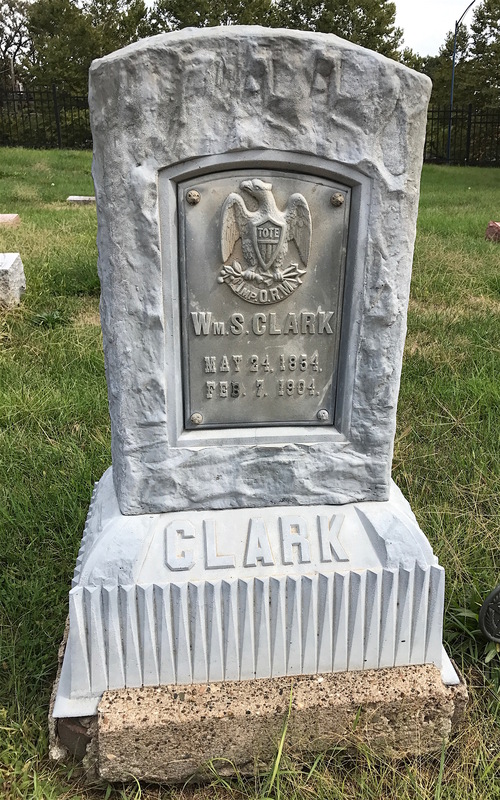 A native of Iowa, William S. Clark was a bricklayer/mason. He married Emma J. Sutton in 1878 and they had one daughter, Eva. The Improved Order of Red Men might sound like an organization for Native Americans but it wasn’t. Prominently displayed on Clark’s marker is the seal of the Improved Order of Red Men (IORM). The TOTE stands for “Totem of the Eagle”. This fraternal organization traces its origin to certain secret patriotic societies founded before the American Revolution. They were established to promote liberty and defy the tyranny of the English Crown. Among the early groups were: The Sons of Liberty, the Sons of St. Tammany, and later the Society of Red Men. Originally called the Society of Red Men, the IORM traces its origins back to 1765. In 1834, they changed it to the Improved Order of Red Men. IORM rituals and regalia are modeled after those used by Native Americans. The organization claimed a membership of about half a million in 1935, but has declined to less than 38,000. The ultimate irony is that the IORM did not allow any non-white members to join until 1974 and it’s doubtful any Native Americans have ever done so. 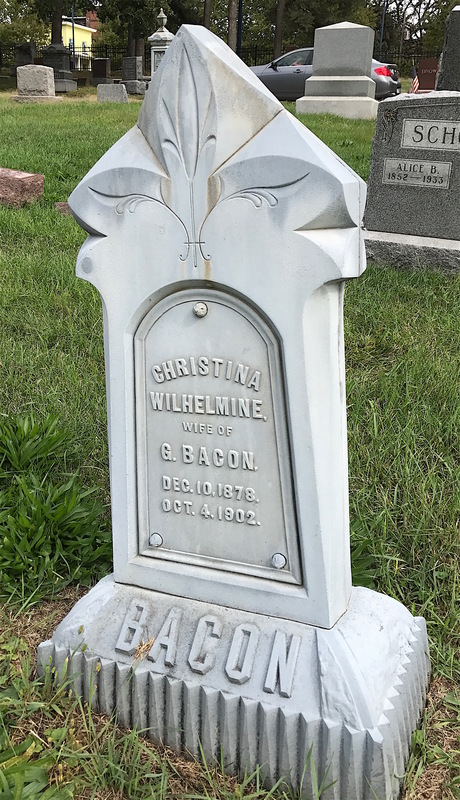 This small marker for Christina Wilhelmine Bacon is rather plain on the front. Christina Wilhelmine Bacon died of tuberculosis in 1902 at the age of 23. But it has the image of a figure pointing Heavenward on the other side. 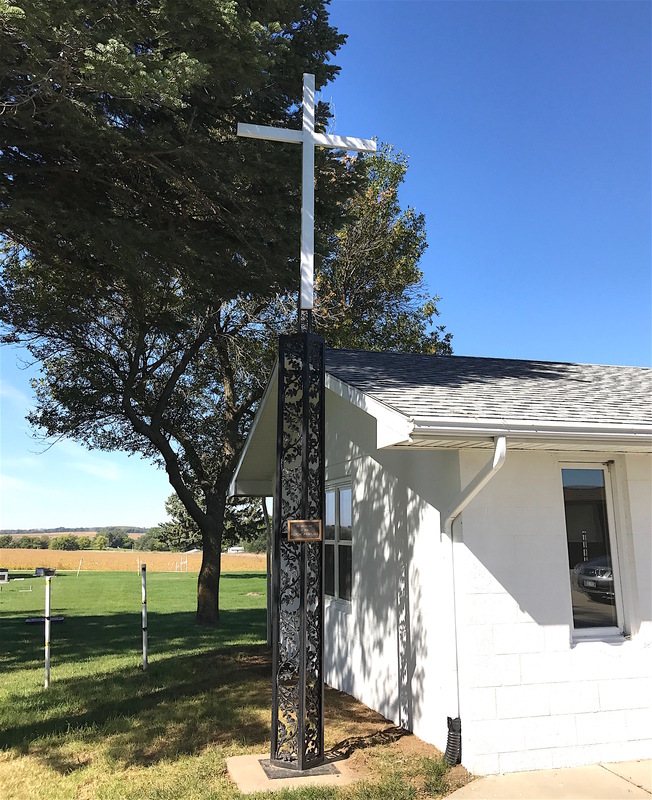 A customer could choose from dozens of different motifs out of a catalog, from a cross to an anchor to even an ear of corn. Herman and Julius Bleckmann’s monument is the most common type of white bronze I usually see. The broken chain can signify breaking the chain of death or the end of life. Born in Germany in 1852, Herman came to America with his parents Julius and Lisette Bleckmann as a child, and worked as a baker. 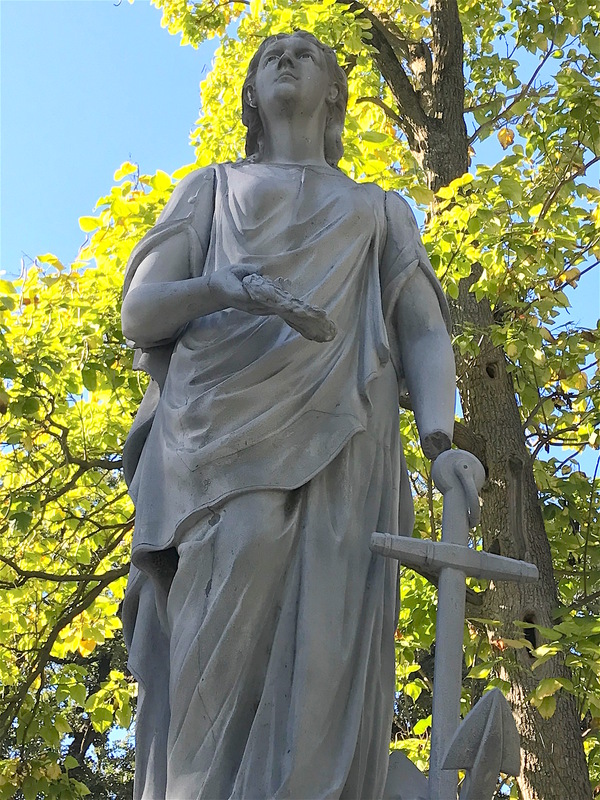 The top of the Bleckmann monument is in need of repair. 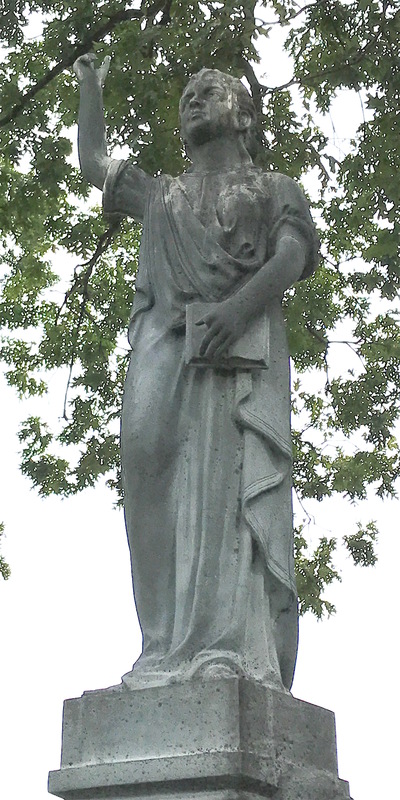 There’s something about the Bleckmann monument that puzzled me at first. I took a look on the base to see where it came from and was surprised to see this. Why did the Bleckmann family order a white bronze marker from Detroit when they could get one from Des Moines? 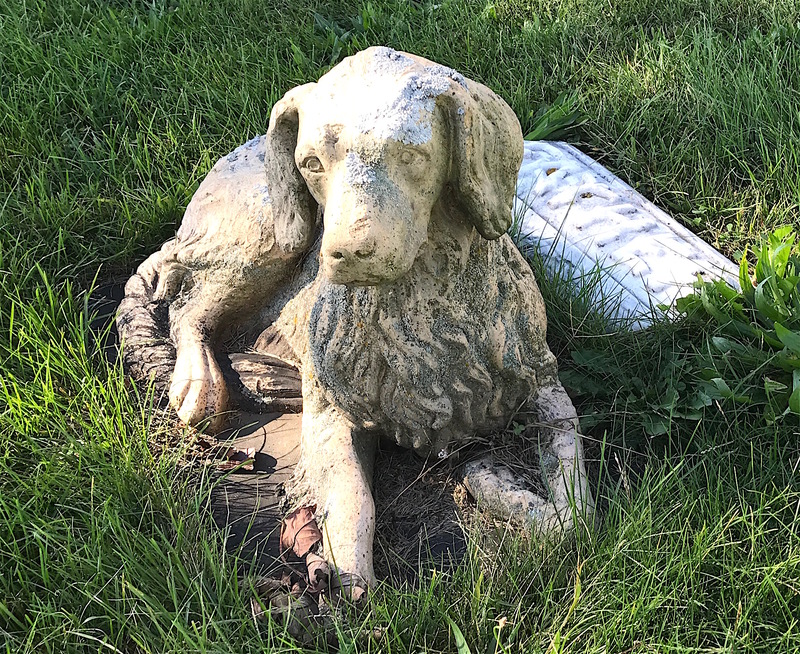 If Des Moines residents had access to white bronze monuments in their own city where a factory produced them, why did this family get one from far-away Michigan? Then I realized that Herman Bleckmann died in 1882. The Des Moines factory didn’t open until 1886, four years after his death. So it makes sense that it came from Detroit after all. 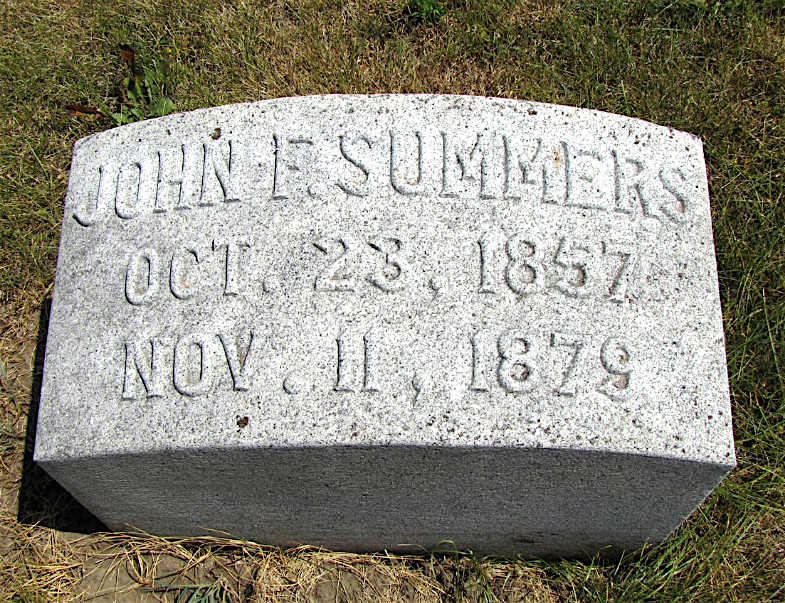 Julius, Herman’s father, whose name is also on the monument, died in 1879. It’s possible the monument was made for him first and Herman’s name was added later but I don’t know. Herman’s life was abruptly cut short, I did discover. He and a friend, George Crane, were celebrating the Fourth of July when something went wrong. At Herman’s front gate, George Crane allegedly shot Herman and he died. Although Crane was arrested and went to trial, he was acquitted. Herman was only 30 and I found no evidence that he ever married. This large white bronze was for Samuel Van Cleve and two of his children. 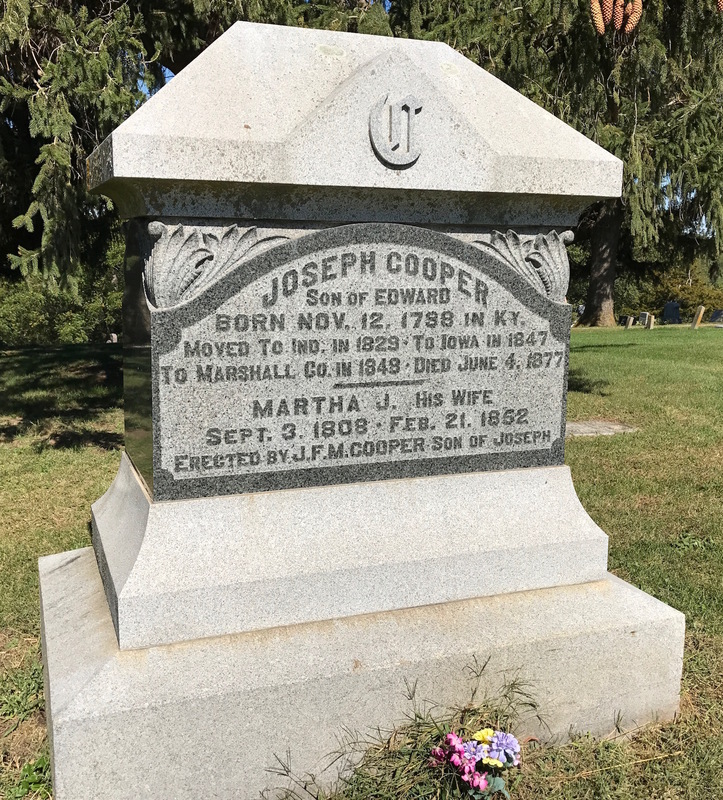 A native of Pennsylvania, he married Ruth L. Cook (daughter of a Baptist minister) in Ohio in 1850. They moved to Iowa in 1855 and had three children. 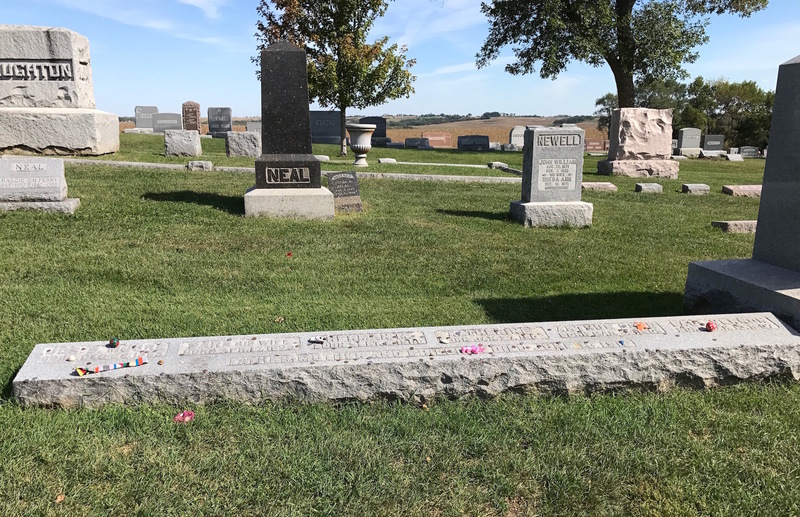 Two died in infancy that are listed on the marker (William and Lillie) but their daughter, Marie Louisa, lived to adulthood and married David (or Daniel on some census records) Bringolf. 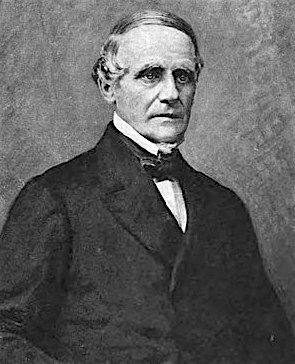 Portrait of Samuel Van Cleve taken from “Portrait and Biographical Album of Polk County, Iowa” published in 1890. Samuel had a number of jobs in public works, most notably as superintendent of the water department and later as an assessor for the city. Samuel died in 1886 at the age of 61. Thanks to Ancestry.com, I was able to pull up his voluminous will. 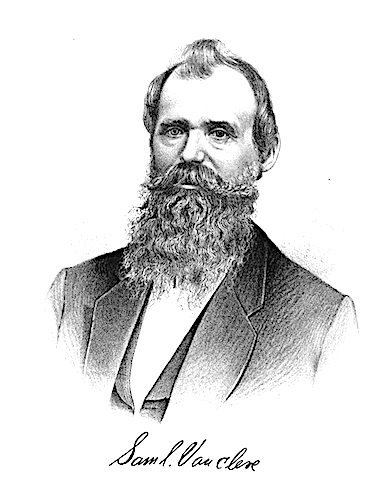 A native of Pennsylvania, Samuel Van Cleve was superintendent of Des Moines’ water department and later, an assessor for the city. According to his will, Samuel Van Cleve owned stock in the Western White Bronze Company at one time. To my surprise, I found that Samuel owned stock in the Western White Bronze Co. From what I can tell, Ruth sold it after he died. The paperwork even included the bills for his casket ($125) and for the white bronze monument that you see above, which cost $465 at the time. You can also see a picture of the receipt for the monument, which she paid in 1888. If you adjust for inflation, the monument cost around $13,000. That’s not cheap! 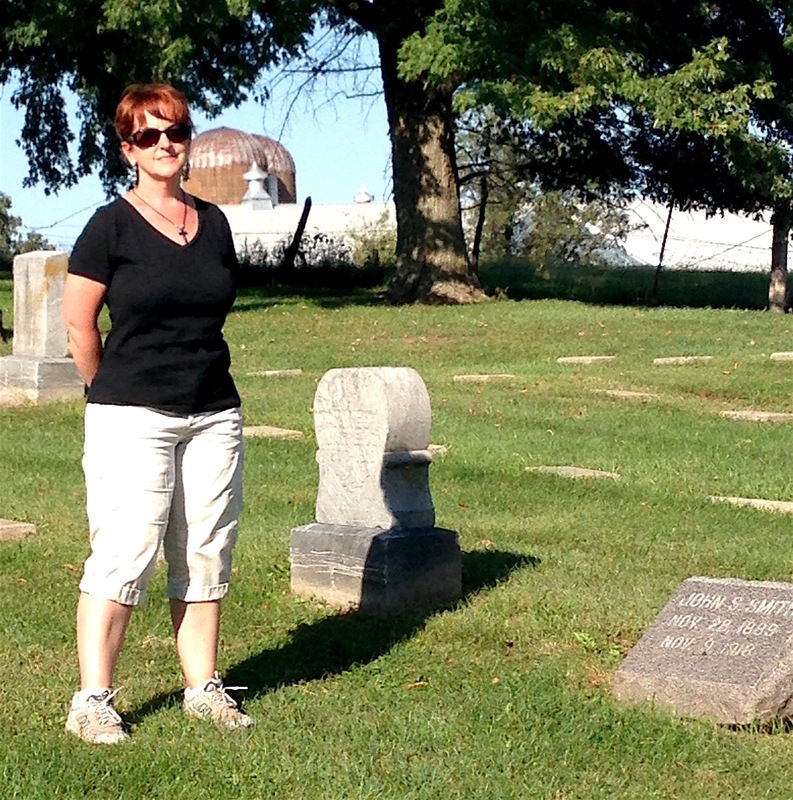 Ruth lived with her daughter and her family in Des Moines after Samuel died. At some point after the turn of the century, the Bringolfs moved to Texas. Ruth died in 1910 and is buried in Myrtle Cemetery in Rock Hill, Texas. She was 93. 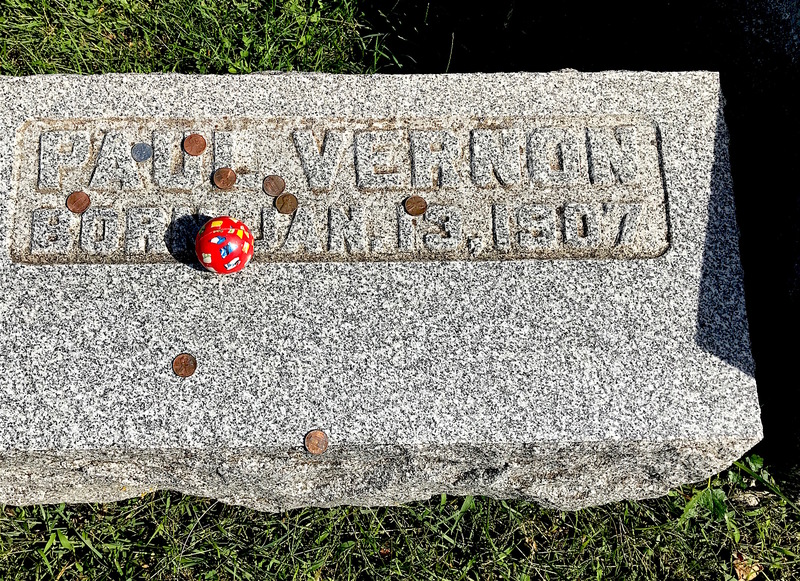 Ruth Van Cleve paid $465 for her husband’s monument in 1888. That would cost around $13,000 today. There’s another white bronze at Woodland worth mentioning because it is not the usual gray/blue color. It has a silver color and a decidedly militaristic flavor. Born in 1834 to Samuel and Mary Myers Orwig in Pennsylvania, Thomas Gilbert Orwig was a patent lawyer and Civil War veteran. There is little information on him prior to the Civil War. He owned and operated the Union County Star with his brother Reuben, which they sold after a year of ownership. I wasn’t sure what the objects on top of this monument were until a kind reader let me know they were artillery pieces. This makes sense considering Orwig’s military background. 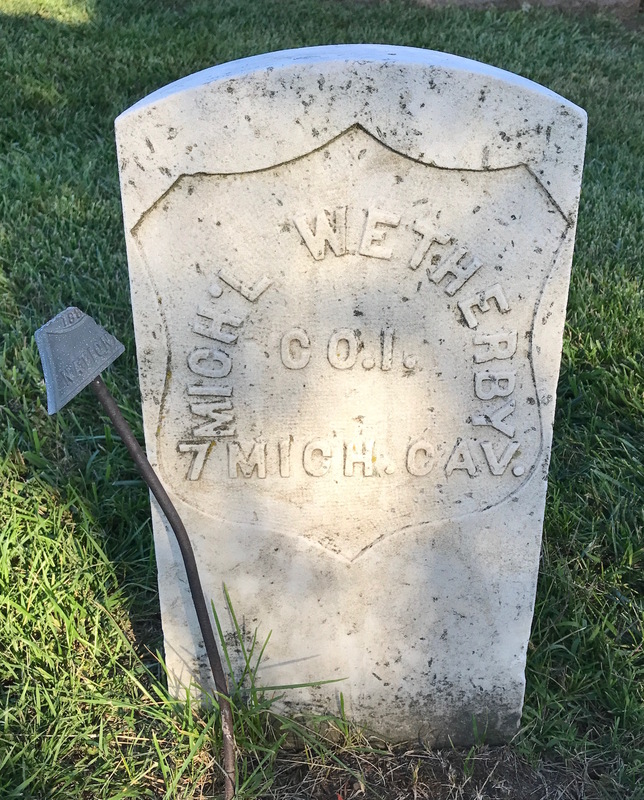 On June 20, 1861, Orwig mustered into service with the 43rd Regiment, First Artillery, Battery E as a first lieutenant. In 1862, he was promoted to captain, and, in this capacity, served in the peninsular campaign and in the Army of the James. 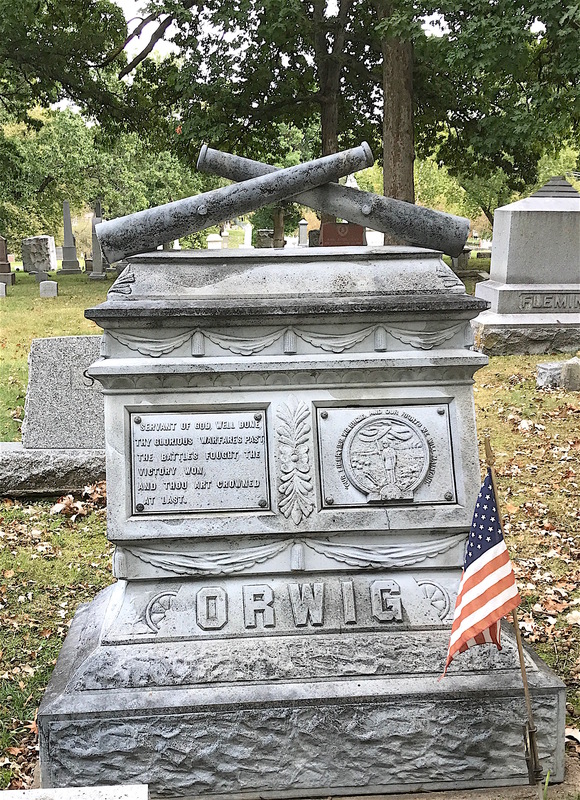 After a three-year term, Orwig resigned with his regiment on September 21, 1864. He married Mary E. Sipp in Middletown, N.Y. in February 1864. They lived together in Yorktown until the end of his service. 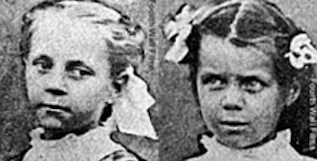 They had two children — Mabel, who was adopted, and Mary Gilberta Orwig born Feb. 24, 1865 and died January 26, 1867. After the Civil War, the Orwigs moved to Des Moines and opened a patent office. I found a patent of his online (he had several) for a type of barbed wire that would prevent animal injury. 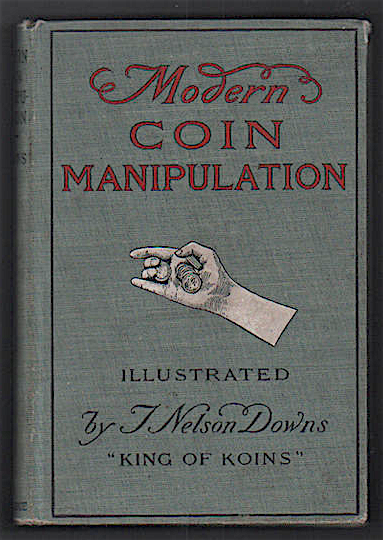 Thomas also established a newspaper in Iowa known as The Industrial Motor in 1872, which was mainly devoted to mechanics, patent rights, and new inventions. Oddly, the date of Thomas Orwig’s death is not on his marker. 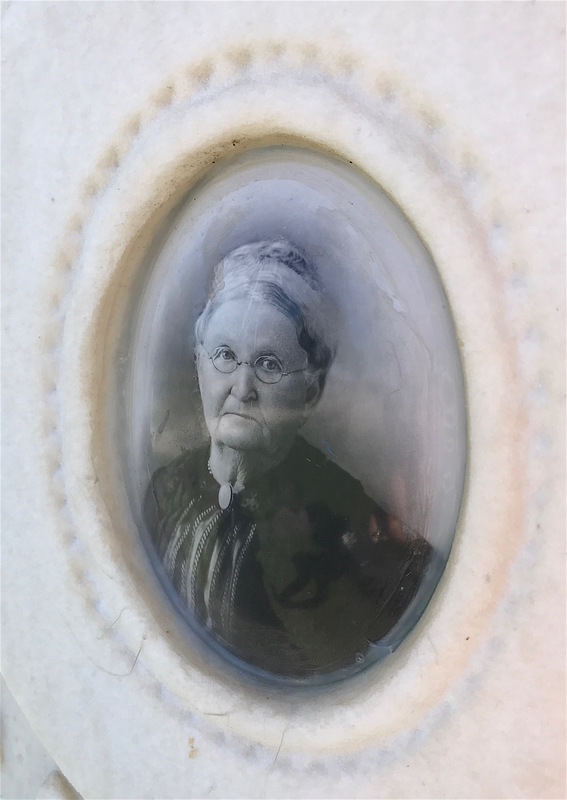 Mary Orwig died on March 10, 1907 at the age of 67. 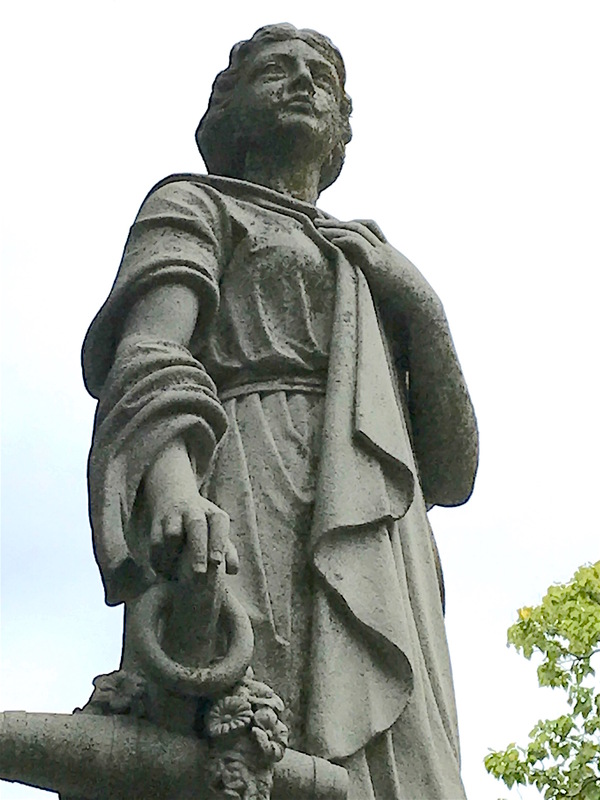 One fact you can glean from the Orwig’s joint monument is that she was blind for 20 years of her life. I am guessing the monument was made when she died and that the information about Thomas was put on it at that time. 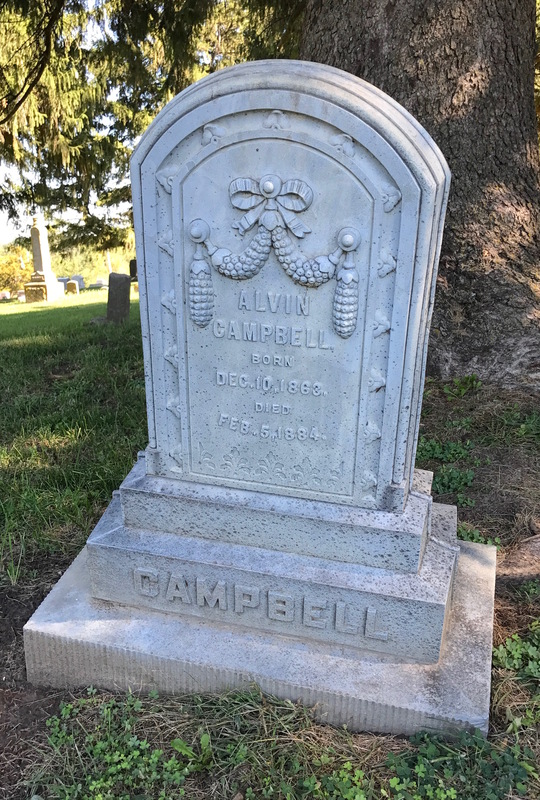 His date of death is not on the monument anywhere but records confirm he died in 1910. The last two monuments I wanted to mention are not white bronze but still stood out to me. The monument for the Rev. Ira Kenney is in the shape of a pulpit with a Bible on the top. A native of Truxton, N.Y., he was a graduate of Madison University and ordained the same year he graduated, 1849. He also married Mary E. Smith in the same year. I’m not sure when they moved to Iowa. The Rev. Kennedy pastored several Baptist churches over the years. He also served as president of what was then known as the Des Moines University in the 1880s, which ultimately closed in 1929. The Rev. 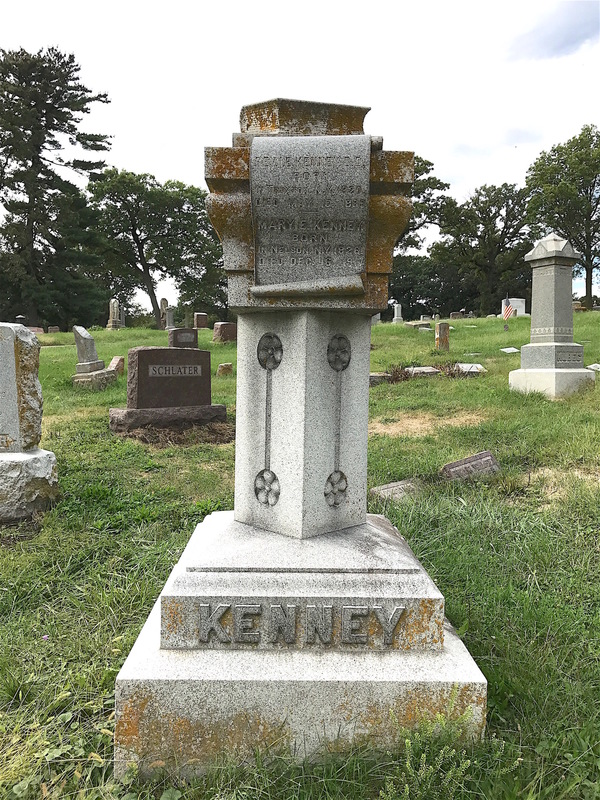 Kenney died in 1899. The Rev. Ira Kenney’s monument looks like a church pulpit. Finally, let’s talk about Landon Hamilton’s imposing monument. 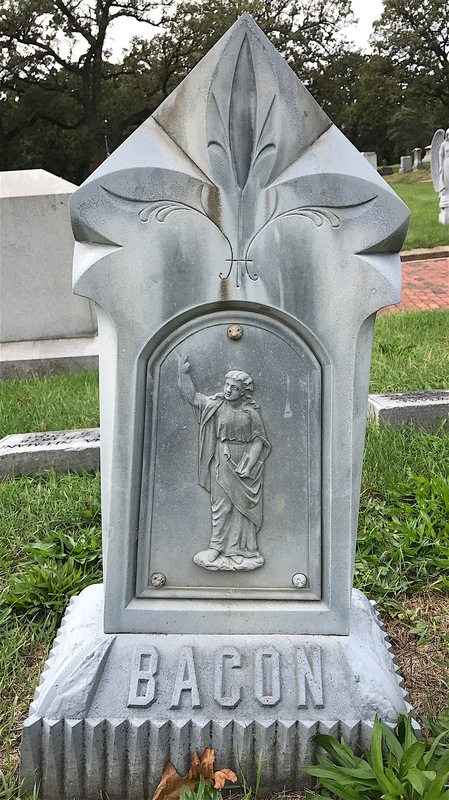 It’s one of the tallest in the cemetery and features the deceased’s face. The Hamilton monument is one of the tallest at Woodland. Born in Virginia in 1816, Landon Hamilton was described as “the dead recluse” by the Des Moines Register in an article written about him. His friend, Judge William Phillips, was one of the few who knew him well but wasn’t sure how Hamilton came to be in Iowa. Hamilton’s love of nature took the place of any family he might have had, he never married or had children. He earned his living by hunting and trapping. In later years, Hamilton catalogued his wide range of specimens, from animals to birds to fish to insects. When he died at the age of 81, his will instructed that his home and massive collection be left to the public for their enjoyment. Some articles claimed the state was going to do something with it, but it may very well have been auctioned off. Hamilton also made specific plans for his monument at Woodland long before his death, down to the portrait etched on it. For a man who wasn’t known to enjoy mixing with people very much, he seemed to want to be remembered by them. That brings my visit to Woodland Cemetery to an end. 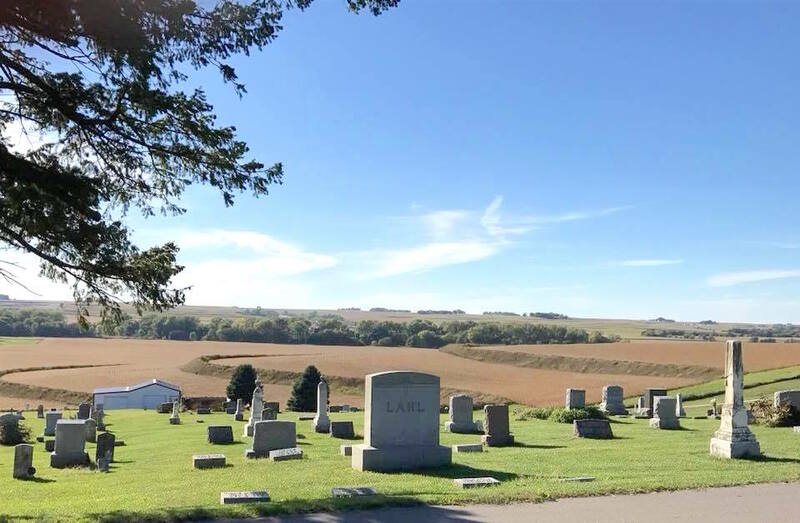 I’ll be moving on to other Iowa cemeteries in the weeks to come, but this one was definitely memorable. 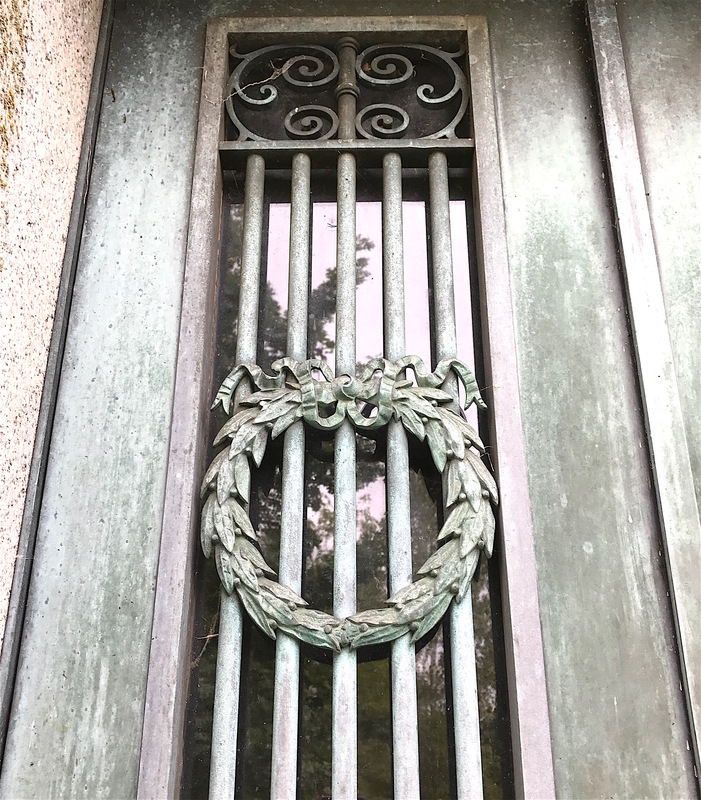 Door of the DeCorpo mausoleum in Saint Ambrose Cemetery, which is part of Woodland Cemetery. Yes, it’s Part III! Woodland Cemetery has enough to keep any “hopper” interested. 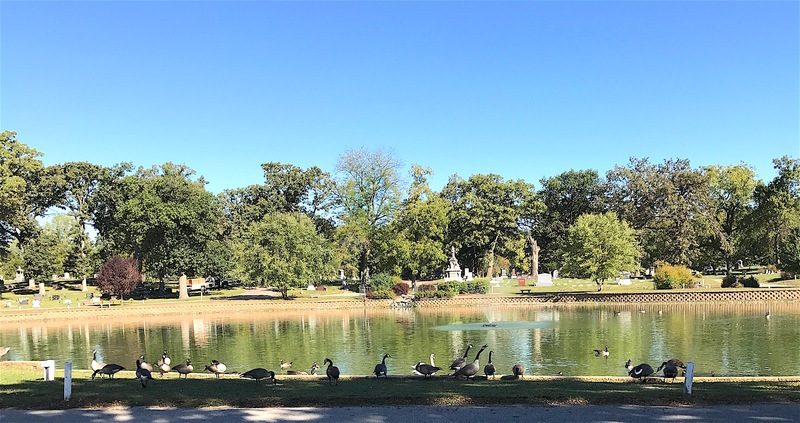 Today I’m featuring three Des Moines businessmen that each contributed to the city’s history in different ways: Hoyt Sherman, Marcus Younker, and Henry C. Hansen. While the Sherman mausoleum is not spectacular, the family is. 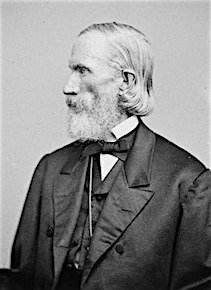 Born the youngest of 11 children in 1827 to Ohio Supreme Court Justice Charles Sherman and Mary Hoyt Sherman, Hoyt Sherman came from a notable family. Brother John Sherman was U.S. Secretary of Treasury (under President Rutherford B. Hayes) and Secretary of State (under President William McKinley). But most will remember his more infamous brother, Union Major General William T. Sherman. 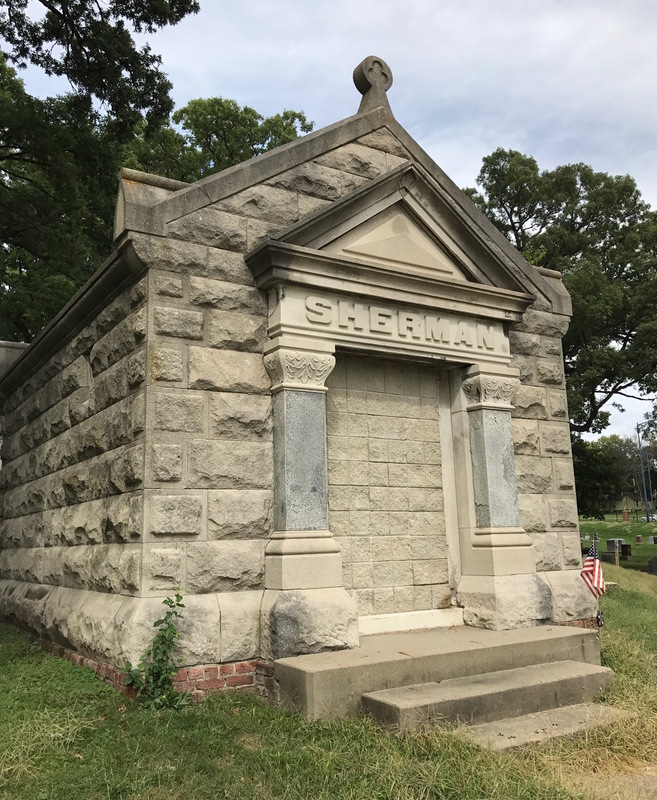 I’m not sure why the Sherman mausoleum is missing its door and is bricked up. Hoyt Sherman arrived in Iowa in 1848 and joined the Bar the following year. In 1850, he was appointed Postmaster and served until he resigned and was elected clerk of the the District Court in 1853. On Christmas day 1855, Sherman married Sara Moulton, an Ohio native. They had five children. President Abraham Lincoln appointed him the Army Paymaster at the start of the Civil War, with the rank of Major. 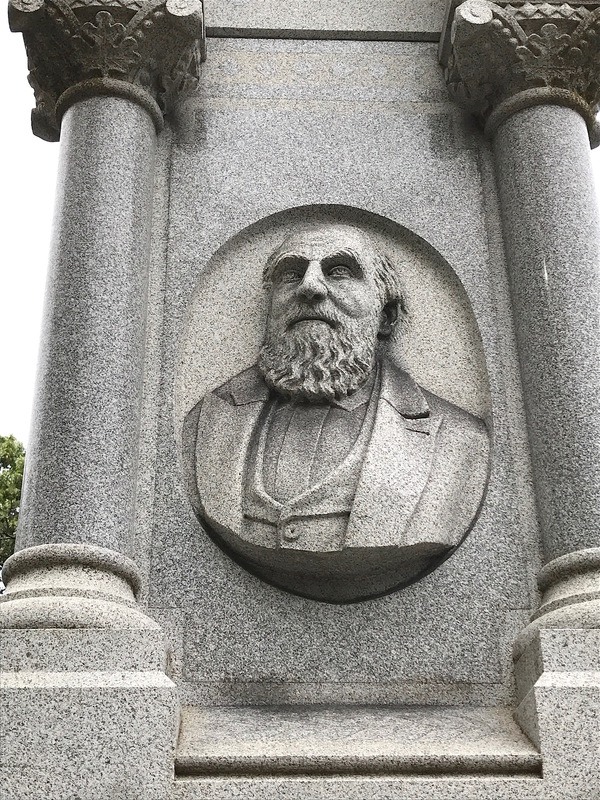 Sherman served as an organizer of the Des Moines Coal Company, the Des Moines Water Company, Equitable Life Insurance Company, and served on the board of directors for the Iowa and Minnesota Railroad, as well as the Narrow Gauge Railroad. 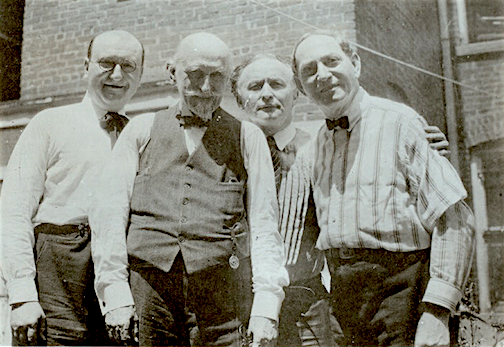 He was also a pioneer member of many organizations and societies. In 1877, Hoyt Sherman Place, the family home, was completed with the help of architect William Foster. Almost immediately, it was noted to be, “a society showplace of the grandest scale.” After Hoyt Sherman’s death in 1904, it served as the first location of Mercy Hospital. 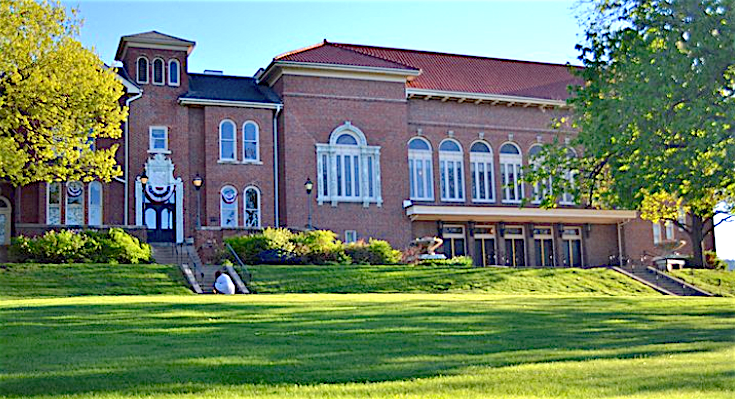 In 1907, it became the clubhouse of the Des Moines Women’s Club, who added an art gallery, the first public art museum in the city. 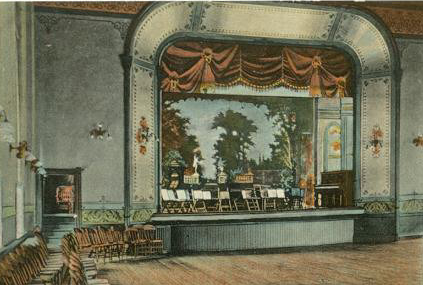 In 1923, a 1400-seat auditorium was completed for Club programs. Today, Hoyt Sherman Place hosts everything from Ballet Des Moines performances to rock concerts. In 2003, the facility underwent a large renovation project to restore the spaces to their original grandeur and add present-day amenities including state-of-the-art electrical fixtures and heating/air conditioning systems. If you’ve visited the Iowa/Nebraska area at all, you’re probably familiar with Younker’s Department Stores. 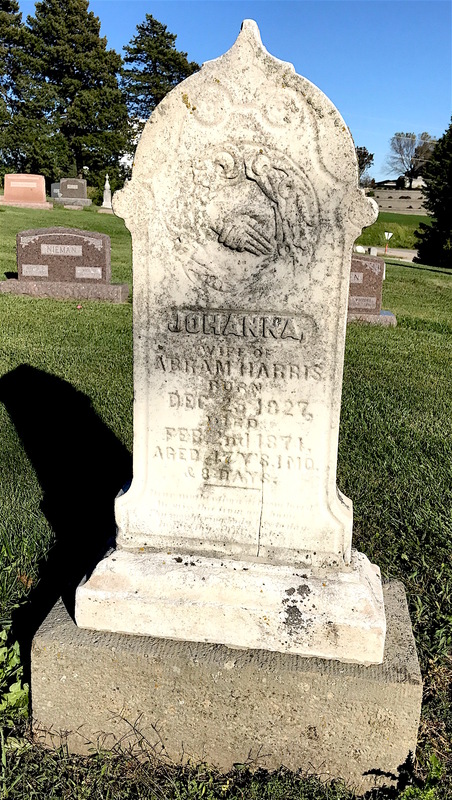 They got their start when three brothers (Marcus, Samuel, and Lipman) from Poland arrived in New York City then settled in Keokuk, Iowa (about three hours east of Des Moines) in 1856. Soon after they arrived, the brothers opened Younker & Brothers, a dry goods store that sold a variety of items. Marcus managed the store while his brothers strapped packs of merchandise on their backs that they carried into the countryside to farmers too busy or far away to come to town to shop. The store was closed on the Sabbath and Jewish Holidays. As Keokuk declined and Des Moines’ star rose, half-brother Herman opened a 1,320-square-foot dry goods store in the capital city. When Samuel died unexpectedly in 1879, the Keokuk store was permanently closed and headquarters moved to Des Moines. The store then became Younker Brothers. 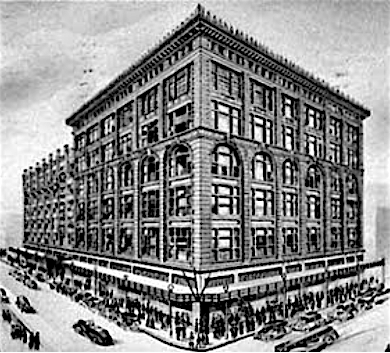 In 1899, the Des Moines store at Seventh and Walnut Streets became the flagship store and remained open until 2005. 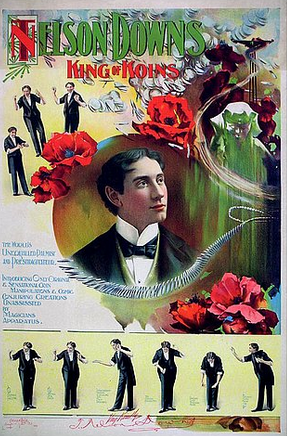 Lipman Younker eventually moved to New York City and was involved in the garment trade until his death in 1902. Herman also moved to New York City to handle the company’s purchasing office there. That left Marcus to run things in Des Moines. Over the years, Younker’s locations multiplied over seven states. But the Des Moines flagship store was special. Women lunched at the elegant Tea Room upstairs, hosting bridal showers and other important events. Teenagers took their dates there for dinner and dancing. The store even had a knitting classroom. Younker’s boasted Iowa’s first escalator in 1939 and was the first department store in the U.S. to air condition its entire building. For many decades, it was a mainstay for shoppers until new parent company Bon-Ton announced in April 2018 that it was liquidating its Younker’s stores. Sadly, the last Younker’s stores closed on August 29, 2018. 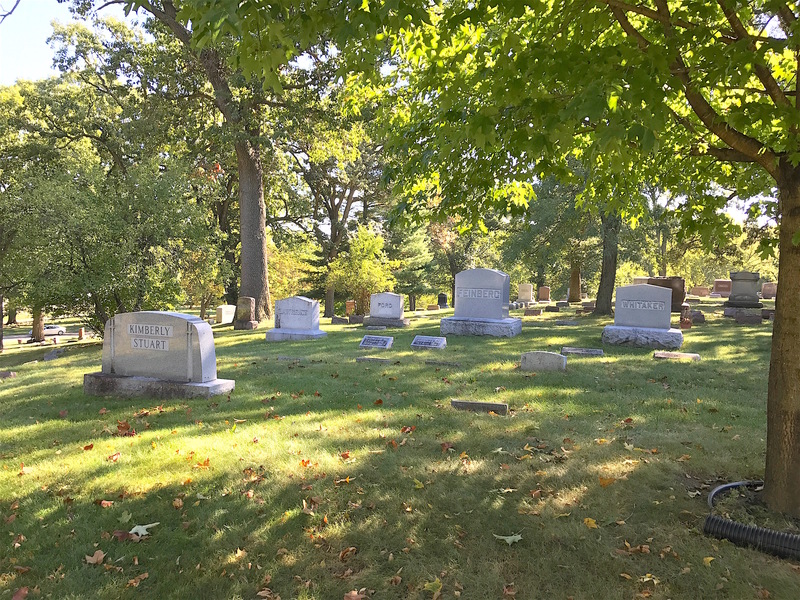 Marcus Younker’s mausoleum is located in Emmanuel Jewish Cemetery, which is part of Woodland Cemetery. 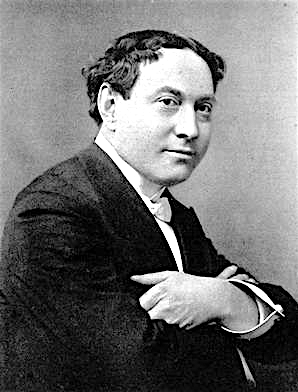 Although he officially retired in 1895, Marcus Younker remained close to help his successors. He balanced commercial interests with religious duties, serving several times as president of the B’nai Jeshurun congregation. 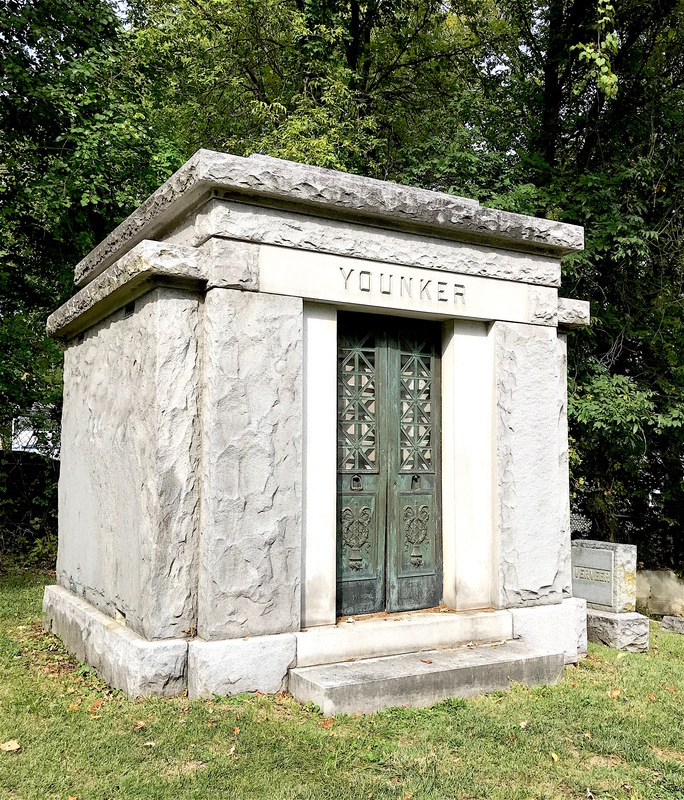 When he died in 1926, Younker’s lost the last of its original founders. 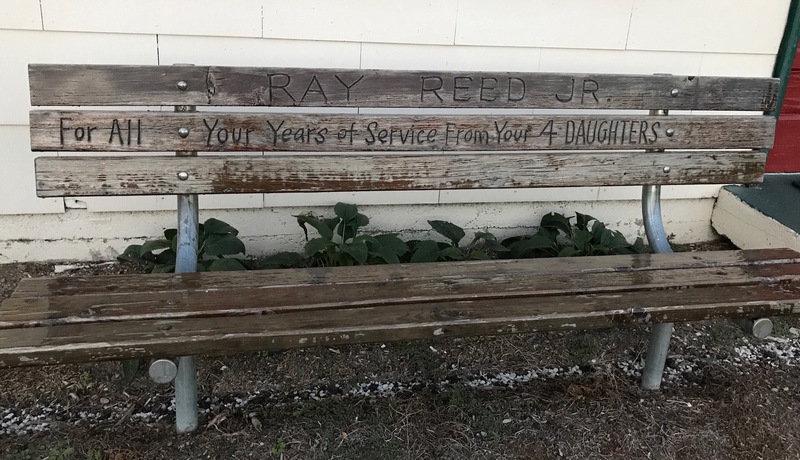 He is interred in the Emmauel Jewish Cemetery area of Woodland with his wife, Annie, and all four of his children (who all lived to adulthood). Despite a 2014 fire at the old Younker’s building on Seventh and Walnut Streets, it is now known as the Wilkins Building and was turned into apartments. The famous Younker’s Tea Room (now known as just “The Tea Room”) was renovated and re-opened in September 2017 as an event space. 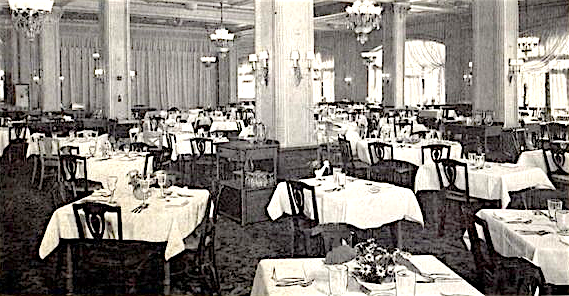 Norwegian native Henry C. Hansen operated and expanded the Wellington Hotel in Des Moines. 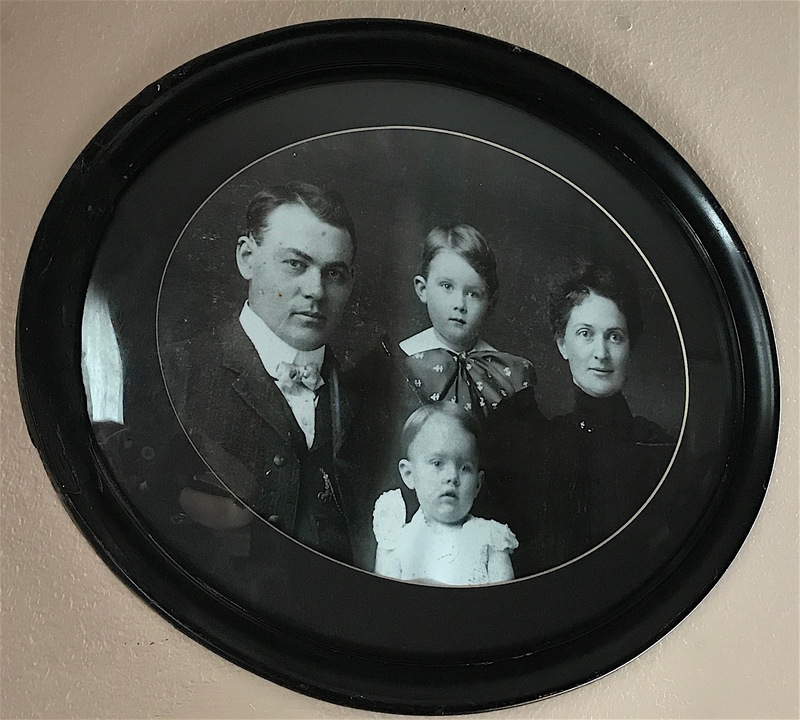 Thanks to helpful Facebook friends with access to Newspapers.com, I was able to uncover the history of the Henry C. Hansen family. 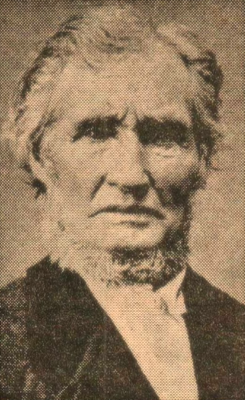 A native of Norway born in 1853, Hansen came to America with his parents Christopher and Martha Hansen in 1856. The family lived in Chicago before buying a farm in Wisconsin. 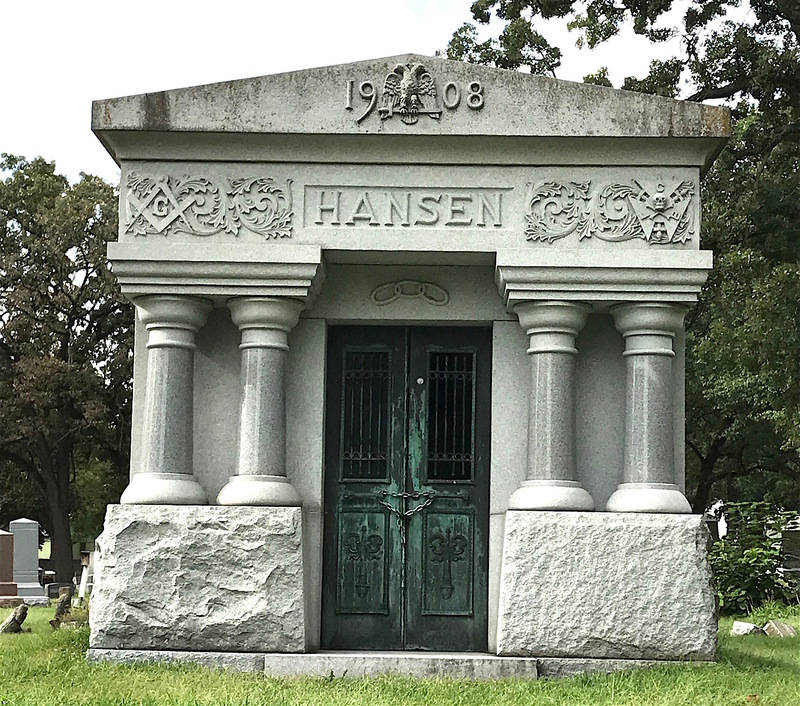 After working for an uncle in the paint business, Hansen attended a Chicago pharmaceutical college and became a druggist. He arrived in Des Moines in 1876 and established the Hansen Drug Co.
His fortunes rose with his store and he eventually moved it into the Wellington Hotel, which he had built earlier himself. Over the years, he expanded and improved the hotel drastically. In addition, he started the Garfield Clothing Company in 1883 and was president of the Home Savings Bank for 17 years. Needless to say he was a busy man! At age 46, Henry married Rose Welton in 1899. She was 25 at the time, 21 years his junior. They had at four children together — Henry Jr., Marthareen, Rose Marie, and Emerett. 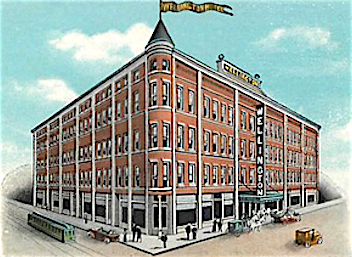 Henry Jr. assisted his father with the Garfield Clothing Co. while Marthareen worked at the hotel. Emerett became an attorney and had an office in his father’s hotel. Rose Marie also worked for her father until she married Herbert Hauge in 1936, who soon after served as an Iowa State Representative for one term. 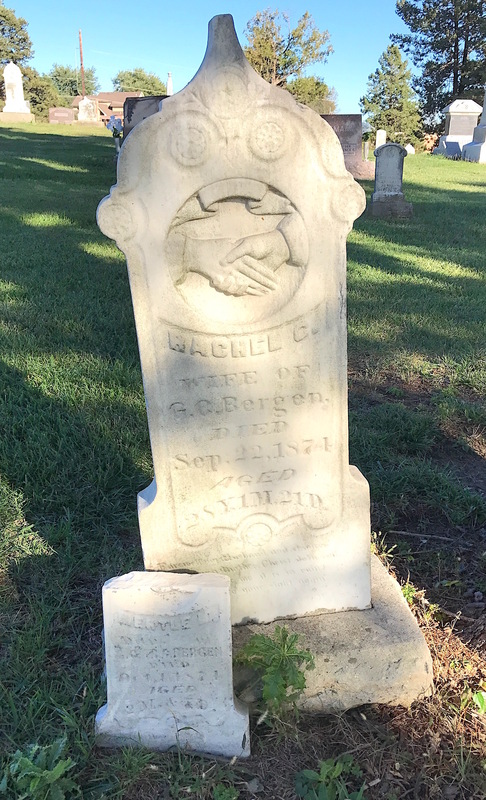 She and Herbert are buried together at Resthaven Cemetery. Unfortunately, the senior Hansen did not always see eye to eye with his eldest son. 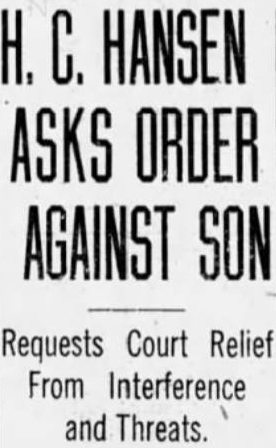 A 1927 Des Moines Register article reported that Henry Sr. requested a restraining order against Henry Jr., claiming that his son was trying to taken over both the clothing company and the hotel after Henry St. suffered a slight stroke earlier that year. Henry Sr. went so far as to allege Henry Jr. had threatened to kill him. Despite the issues noted in the 1927 article, after Henry Sr. died in 1935 of a cerebral hemorrhage, Henry Jr. took over the Garfield Clothing Co., selling it to Emerett in 1957. Henry Jr. married in 1939 but his wife, Ruth, sought to divorce him in 1943 under charges of cruel and inhumane treatment. She also asked for a restraining order. When Rose Welton Hansen died in 1962, Henry Jr. appeared to no longer have any ties with the family businesses. But when he learned that his mother left the bulk of her estate worth well over $100,000 to his siblings Marthareen and Emerett, he contested her will in court. I’m not sure how that was resolved but Henry Jr. died in 1968 in a nursing home. 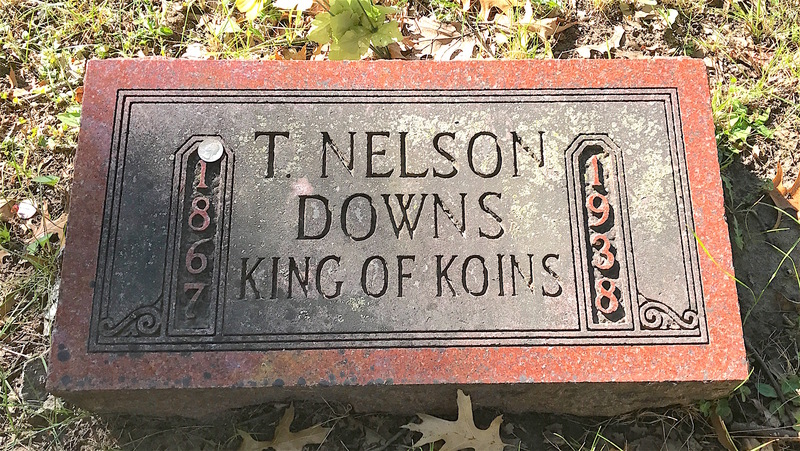 Despite the turmoil over the years, he is interred with his parents in the Hansen mausoleum at Woodland. Later, he was joined by siblings Marthareen (who died in 1972) and Emerett (who died in 1989). Note the different textures of the stones beneath the pillars on both sides of the doors. Speculative Masons use the ashlar (finely dressed stone) in two forms: one rough (left), just as it came from the quarry, representing Man in his uncultivated state. The other (right), finely finished and ready for its place, represents Man, educated and refined. Many thanks to Mason Todd Oberlander for sharing this information with me. The Hansen mausoleum did not grab my attention until I was looking at my pictures from Woodland this week. To the left above the pillars and to the center are two Masonic symbols, the “G” and the double eagle representing the Scottish Rite. However, if you look at the upper right hand corner above the pillars, you can see what I recently learned was the “death’s head” version of the insignia of the Knights of Pythias. 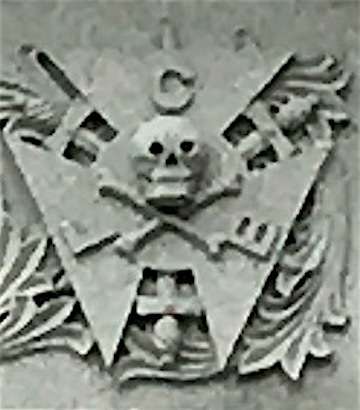 Many American fraternal organizations, including the Masons, use the skull and crossbones in their symbolism. For the Masons, it signifies mortality. I had to zoom in so it’s not very clear but you can definitely see the skull. Founded in 1864, the Knights of Pythias was the first fraternal organization to receive a charter under an act of Congress. Its founder was Justus H. Rathbone, who was inspired by a play by Irish poet John Banim about the legend of Damon and Pythias. This legend illustrates the ideals of loyalty, honor, and friendship at the center of the order. On this seal, the FCB stand for “Friendship, Charity, and Benevolence”, the Pythian motto. 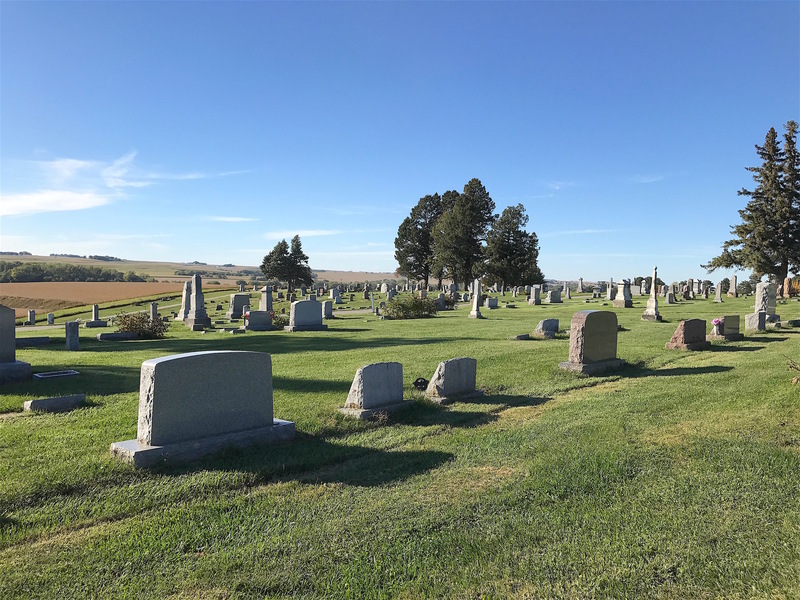 As a prominent businessman, it’s not surprising Henry C. Hansen belonged to several fraternal organizations like the Masons and the Knights of Pythias. 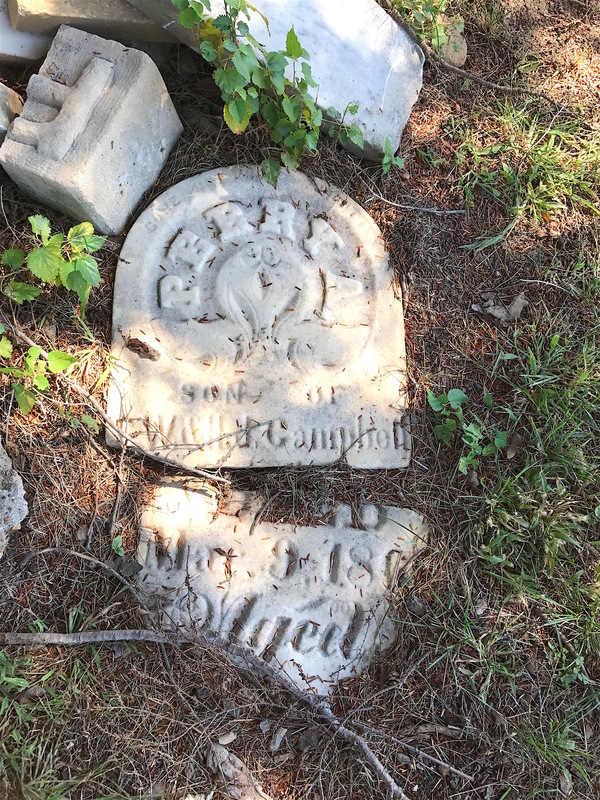 And it’s true that you can find memento mori (Latin for “remember, you will die”) skulls decorating many a slate gravestone from the late 1700s to mid-1800s. But this is the first time I’ve ever seen a skull on an American mausoleum. 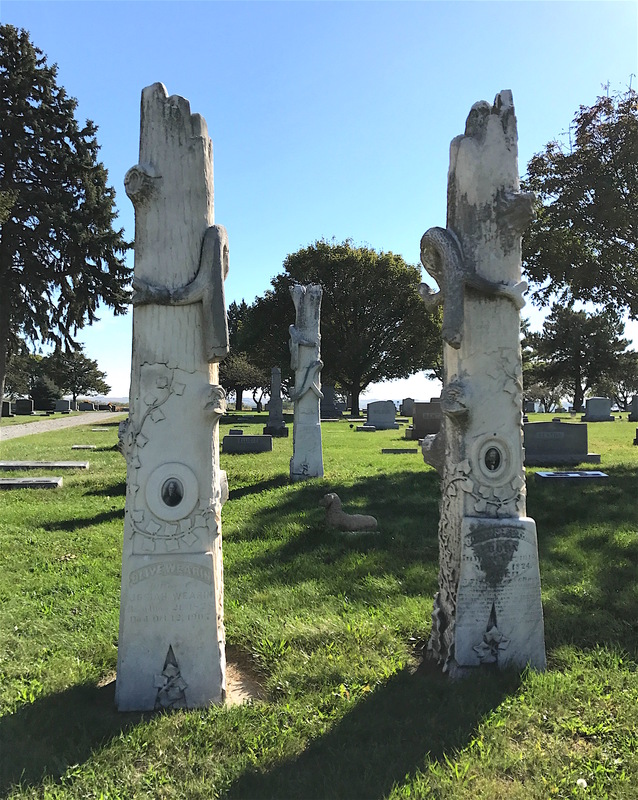 Next week, I’ll wrap up my series on Woodland Cemetery by featuring a few more eye-catching markers and monuments.